The weather did a back flip today, it dispatched the gunmetal grey blanket of cloud and rain and brought out one of those rare, balmy autumn days. 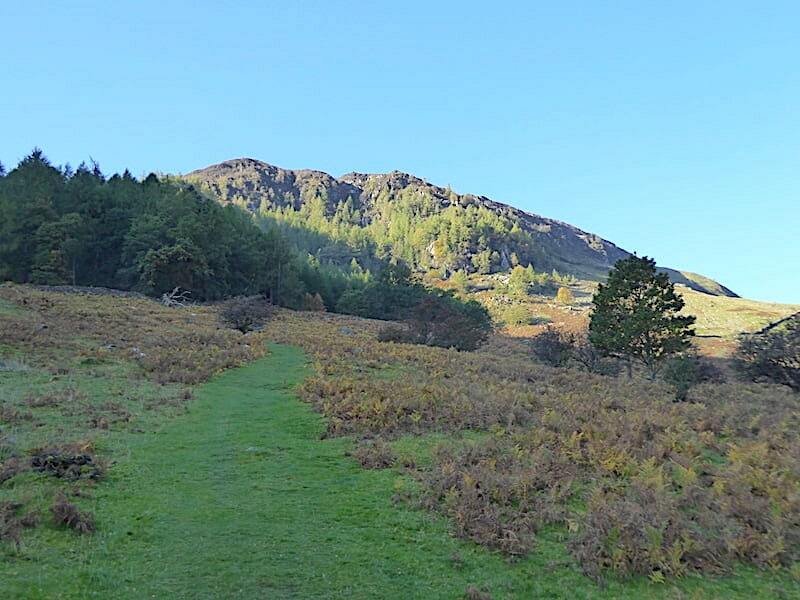 We opted for a walk up through Glencoyne to Nick Head and then onwards to the summits of Green Side, Stybarrow Dodd and Raise. 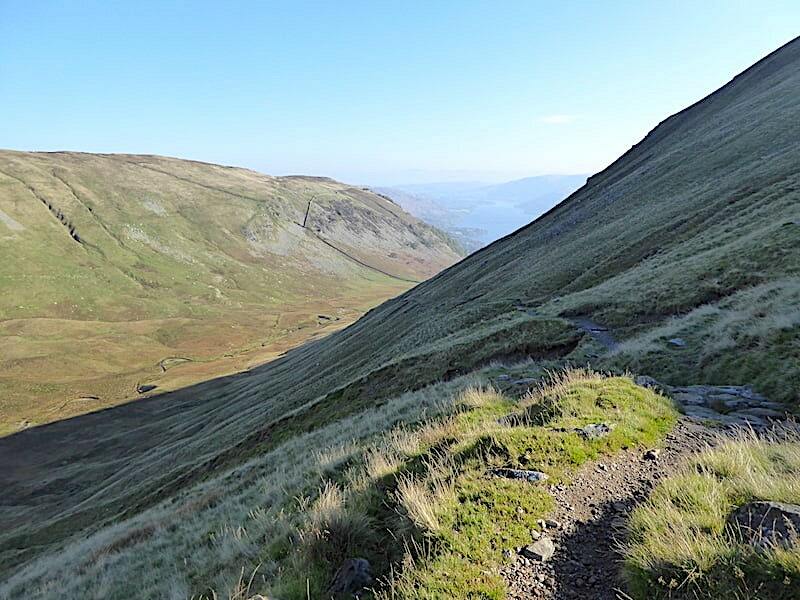 The long, and often very steep, climb from Glencoyne Bay up to Stybarrow Dodd involved plenty of brow mopping stops, especially as we were sheltered from the strong southerly wind by the northern slopes of Sheffield Pike and were bathed in very bright sunlight. 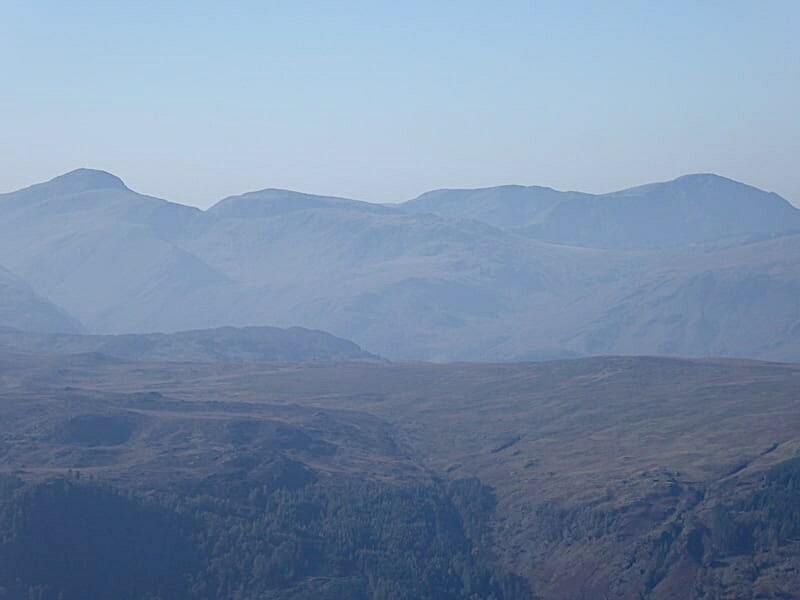 Long distance views were very hazy today which is always the case when the air flow comes up from the south, pin sharp definition generally arrives with a northerly air flow, but no matter, it was good to get outdoors again after several days of very dismal weather. 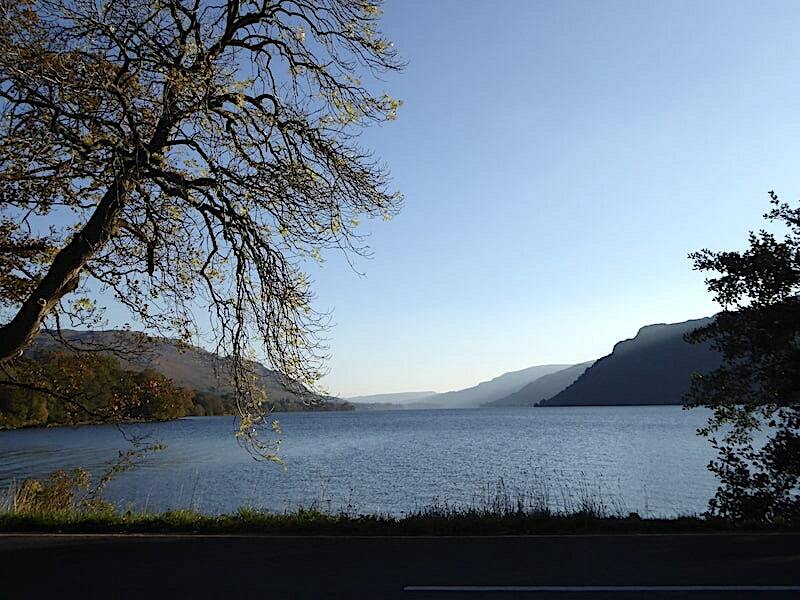 A look along Ullswater from the Glencoyne Bay car park just before we set off on today’s walk. 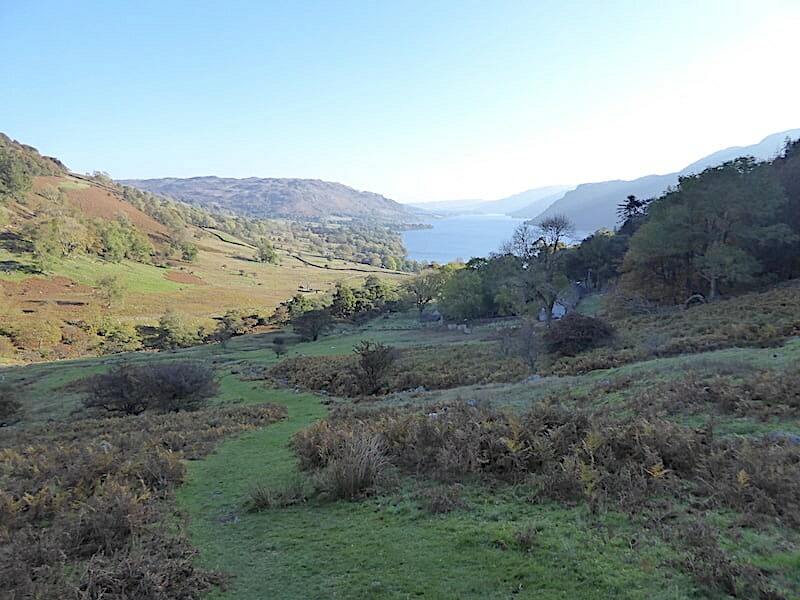 Straight out of the car park and we follow the Ullswater Way track for a few yards taking a look over at Sheffield Pike and Green Side as we walk across. 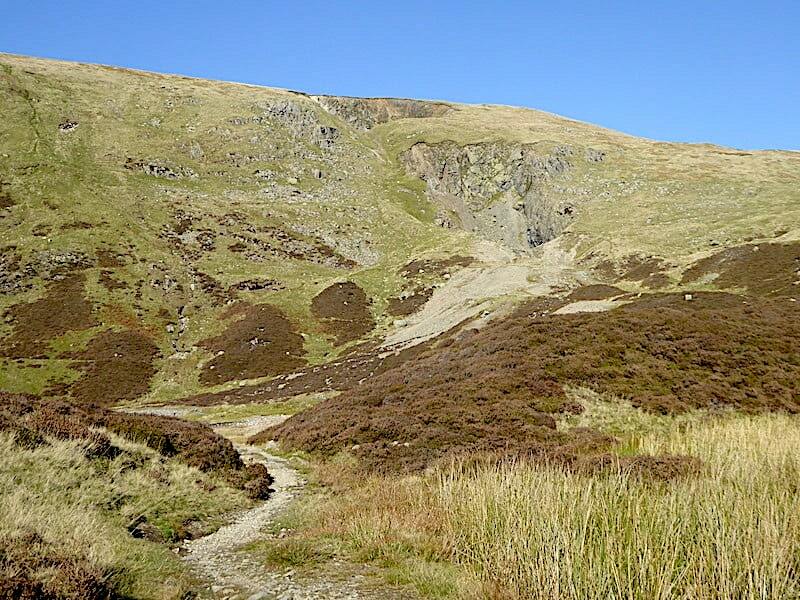 We’ll be walking alongside the wall which is crossing the fell side below Sheffield Pike before too long. It looks to be quite a gentle rise at this distance, its a different thing altogether once you get onto it. 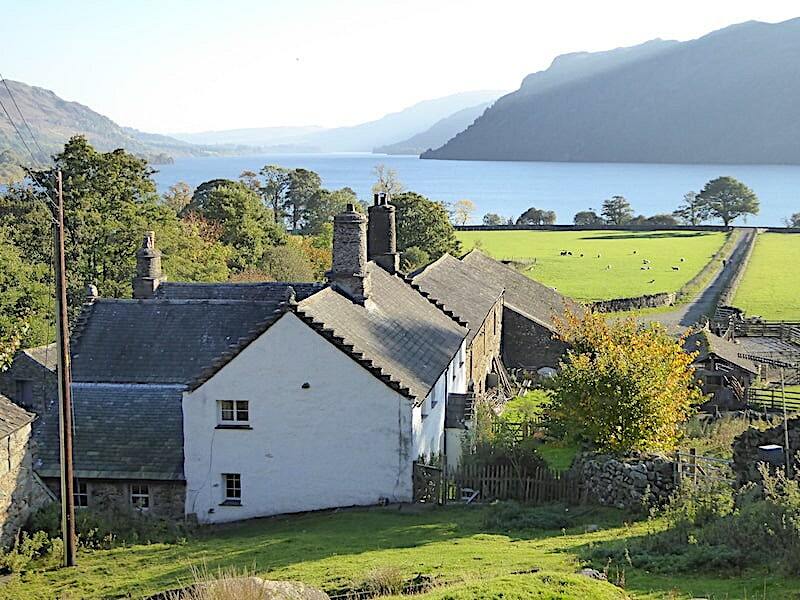 We left the Ullswater Way path at the end of the field and turn right up the farm lane towards Glencoyne Farm. This is a public footpath so there’s no need to worry about passing through the farm. 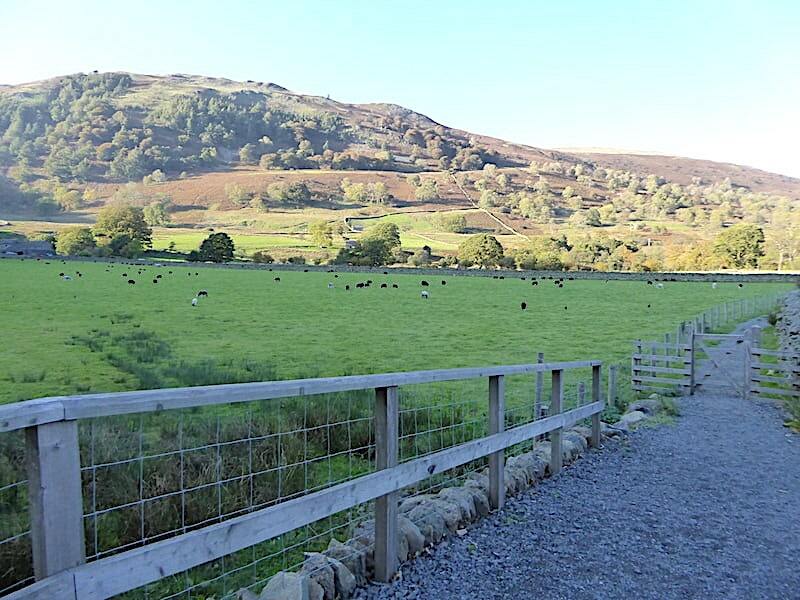 A sign marked with a small arrow and the word ‘Path’ directs you through the sheep pens, the farm buildings, through the front garden and onwards up this short and steep rise. It may be a public footpath but it still felt very intrusive to be crossing someone’s front lawn and walking right past their front door, just as well nobody was in their beachwear doing a spot of sunbathing. Beyond the short steep rise immediately after the farmhouse the gradient eased off a little and the path took us quite gently along Glencoynedale giving us a very pleasant stroll just below Glencoyne Wood with the beck for company. 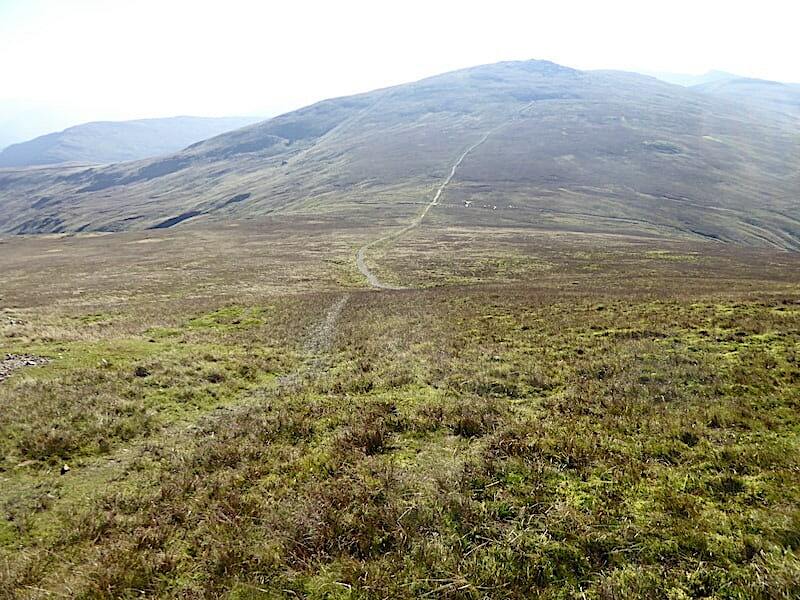 The gentle stroll came to an end at this point where the path began leading us very steeply upwards. It doesn’t look much but a couple of stops for a mop round, and to allow our calf muscles to stop yelling for mercy, had to be taken on the way up. 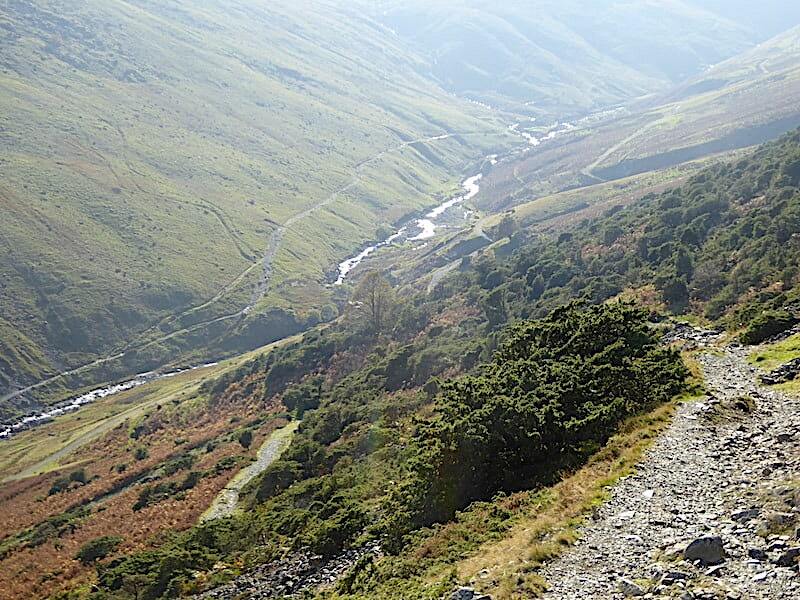 A look back down the dale from one of our stops. Over to the right and almost hidden in the trees is the row of former mineworkers cottages known as Seldom Seen. Our route didn’t take us very near to it so I wasn’t able to take a shot of it in close up. 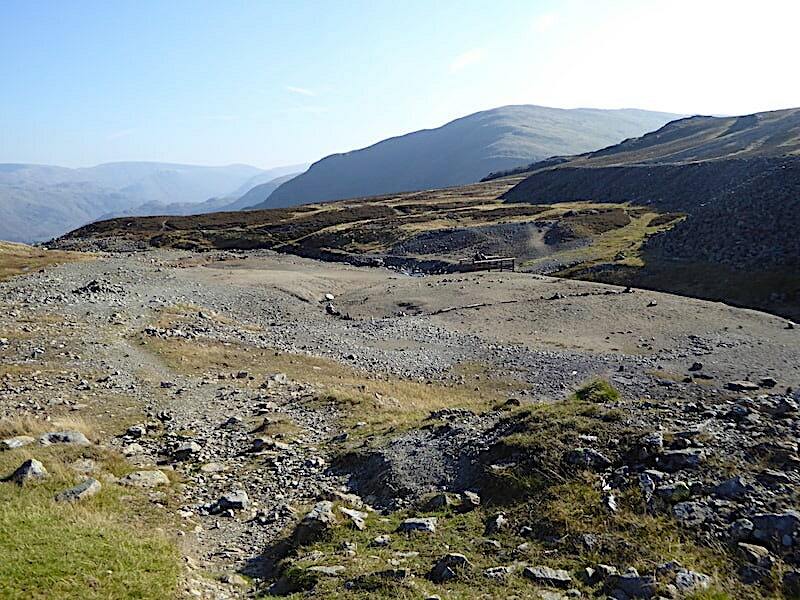 The north facing slopes of Glenridding Dodd are still casting shadows but even so its still proving to be very warm work and our faces and necks are damp with sweat. Jumpers were removed some time back. 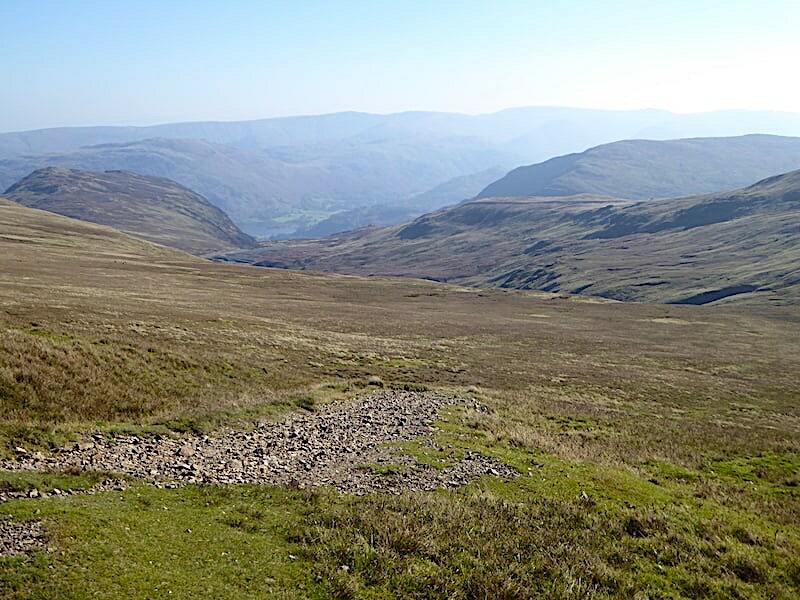 We’re beyond the shadow of Glenridding Dodd now and have just passed through a gate in the wall where, coming in from the left of it we join another path, this one coming up from Seldom Seen. 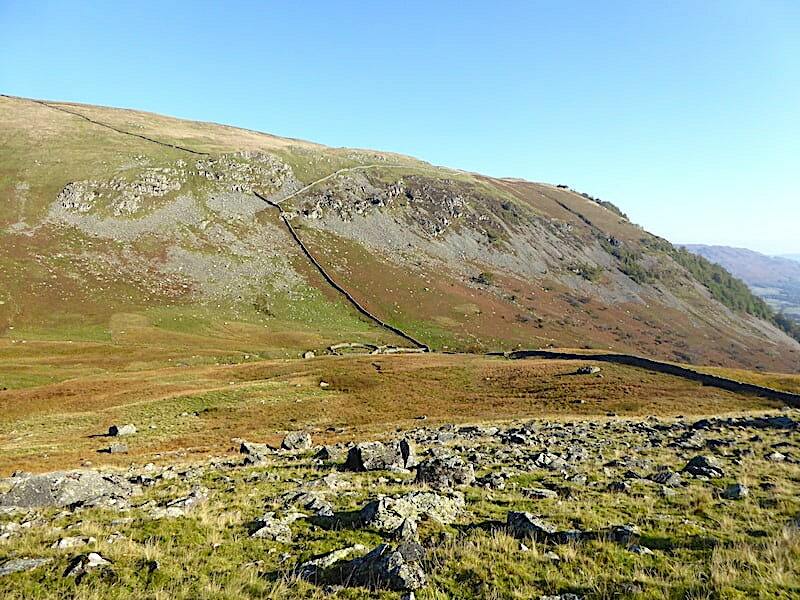 The path now keeps to the left of the wall and continues to climb very steeply beneath Sheffield Pike’s Black Crag. 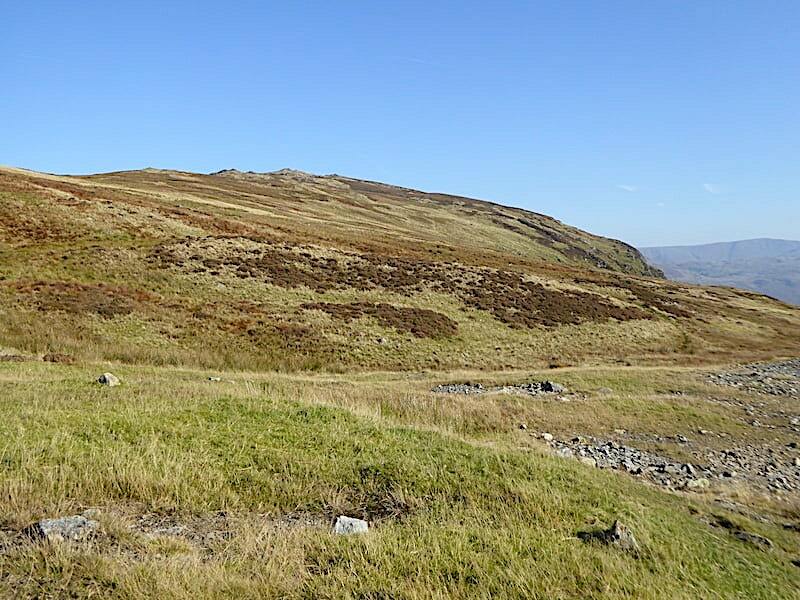 We’re pretty much out on the open fell sides now as the trees and shrubs are gradually being left behind. 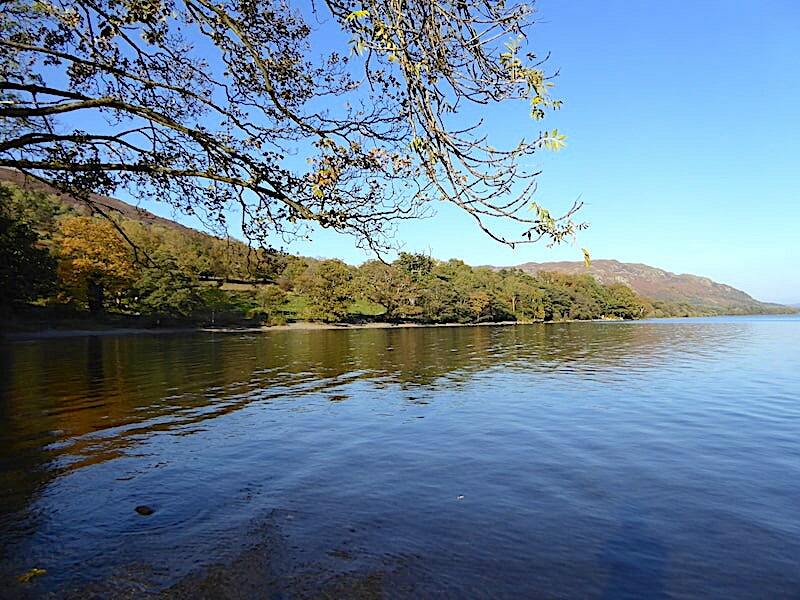 Most of Ullswater is now in view with Gowbarrow on its left shore and Place Fell on the right shore. The very steep climb eventually comes to an end at another wall which has two gates. 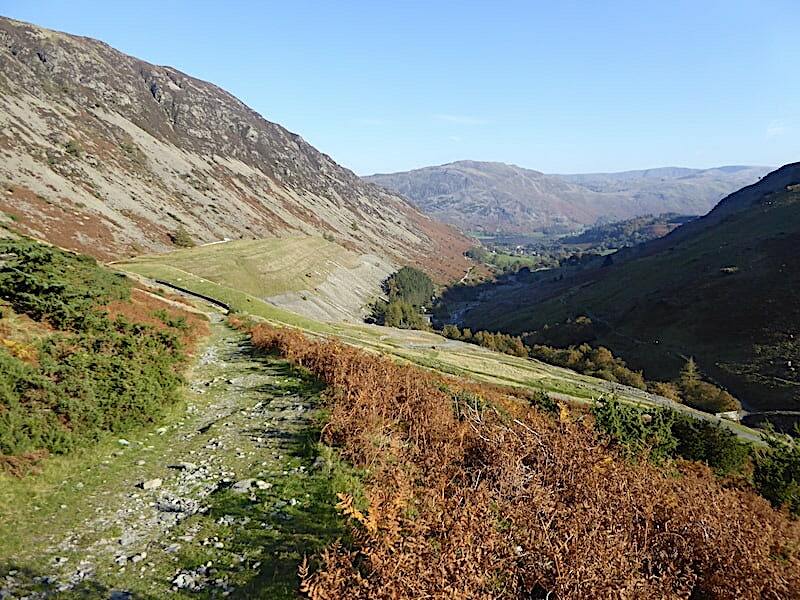 The path continues on through the upper gate which J went through while I took a short diversion through the lower gate for this view towards Glencoyne Head with Green Side on the left and Hart Side on the right. 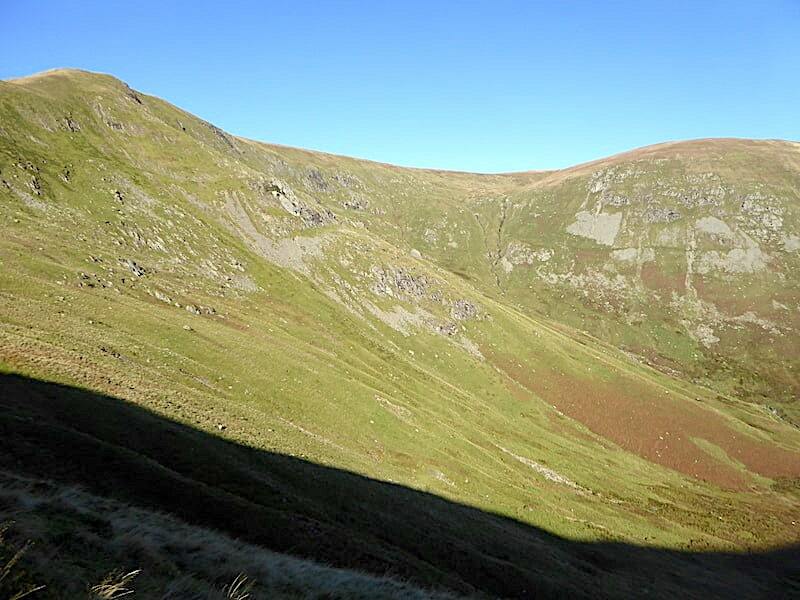 Whether this is classed as a hanging valley I’m not absolutely certain but it certainly looks like one …..
….. especially when you look back at the wall which crossed the flatter land below us at the point where the upper valley ends before dropping steeply down to the lower one. 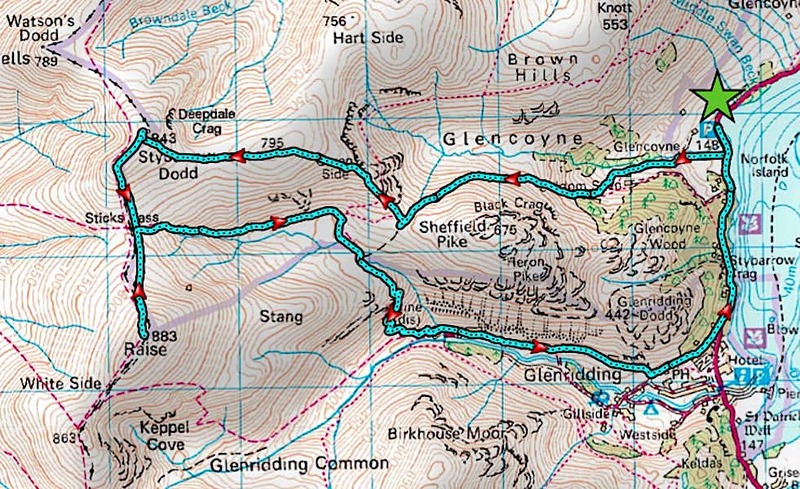 Back with J on the path now as we carry on across the rather gentler gradient over Bleabank Side. 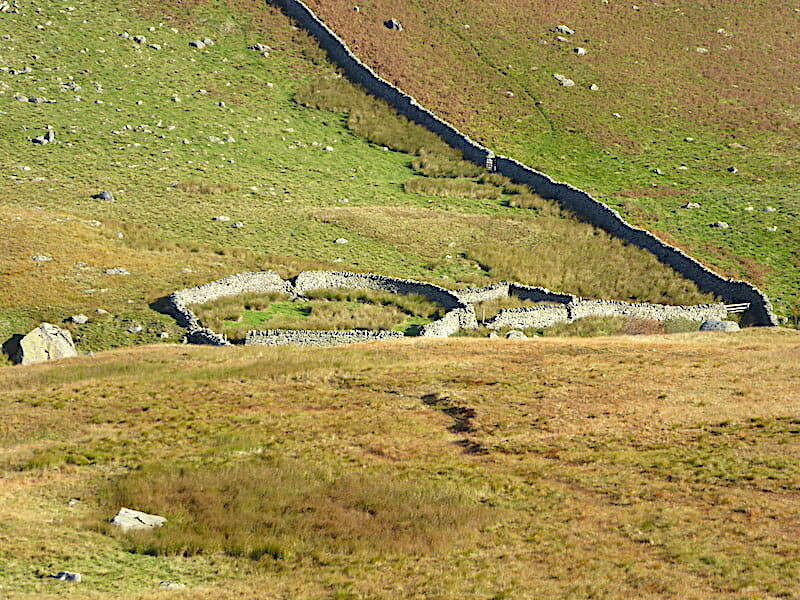 The wall in the shot is the one with two gates and tucked neatly beside it and Glencoyne Beck is a rather more unusually shaped sheepfold compared with the rectangular ones we often find along the way. 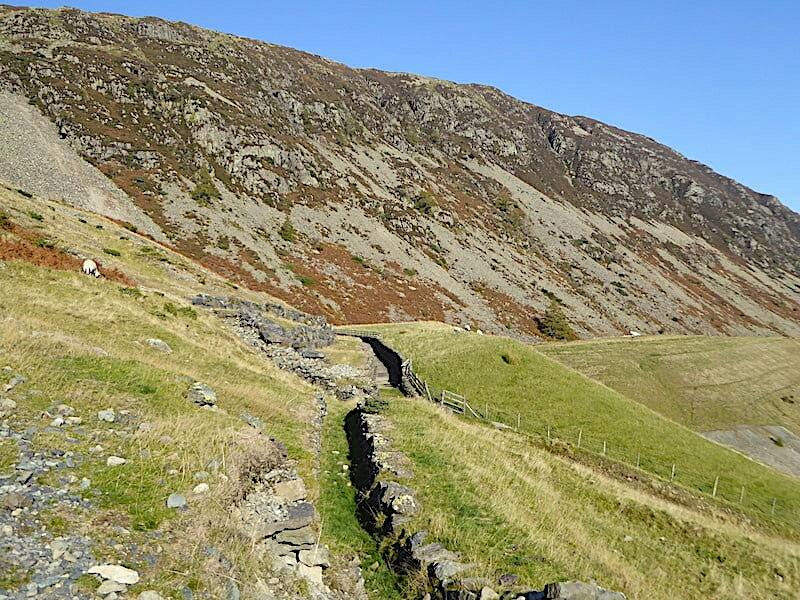 The wall continues up the steep fell side of Glencoyne Brow, stops at the crags and then carries on again all the way up to Birkett Fell. I remembered the creative stone walling over crags which we saw on a couple of our recent walks, namely Ulgraves on Potter Fell and Little Gowder Crag on our Steeple walk, and couldn’t help thinking that the wallers who built those probably wouldn’t have let those crags up there prevent them building one continuous wall. 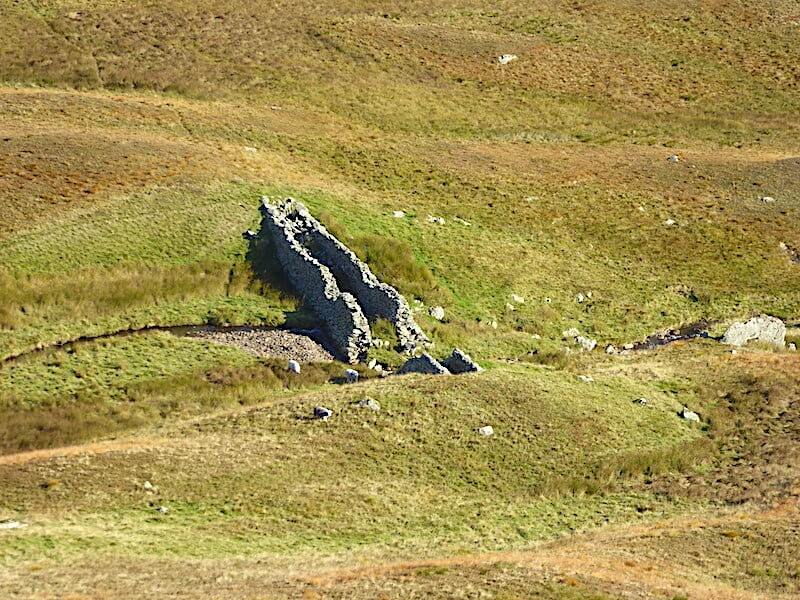 A zoom in for a closer look at the sheepfold beside the beck. 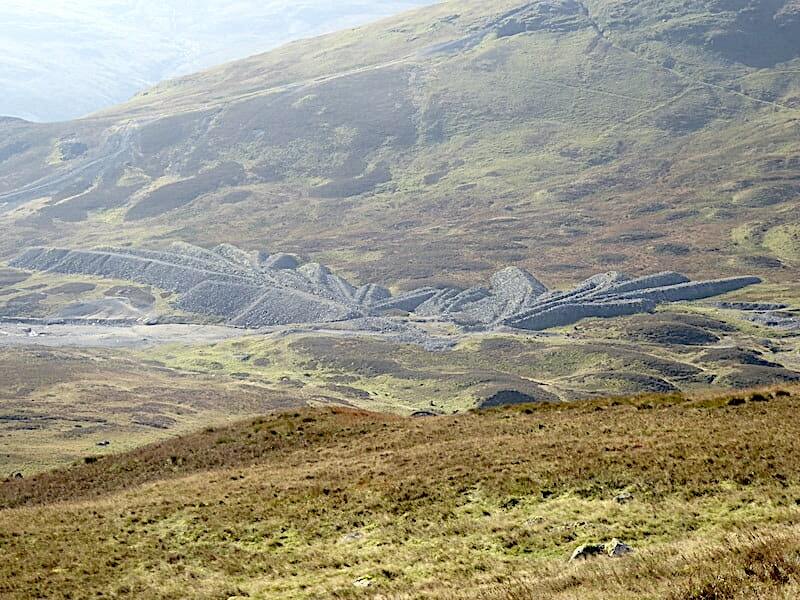 A close up shot of another interesting feature crossing the beck, a disused dam. 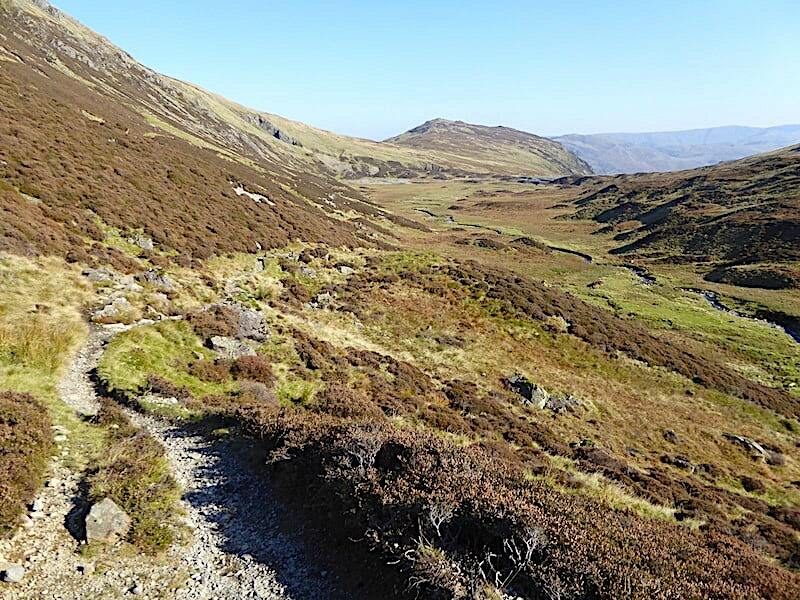 We continue along Bleabank Side where every now and again the path levels out and our legs are able to relax and enjoy a little effortless walking for a few minutes. 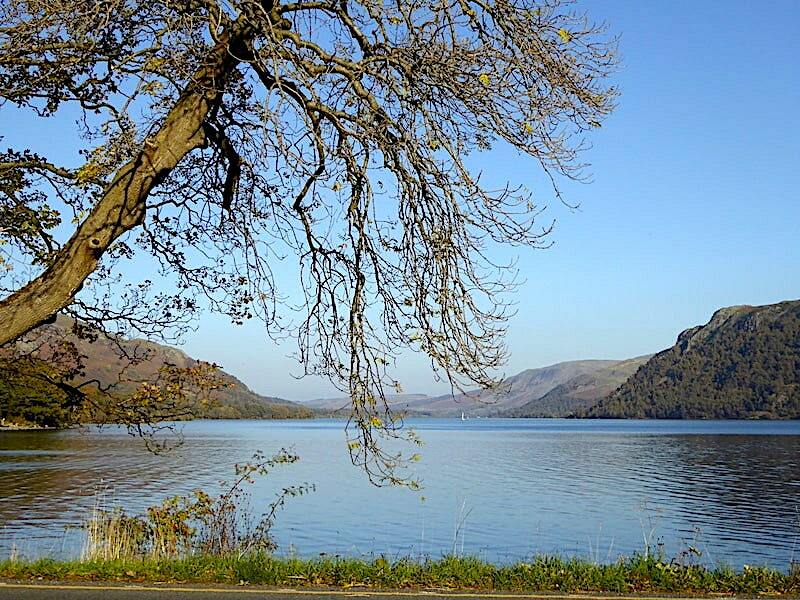 A quick look back at Ullswater where the hazy conditions still prevail. 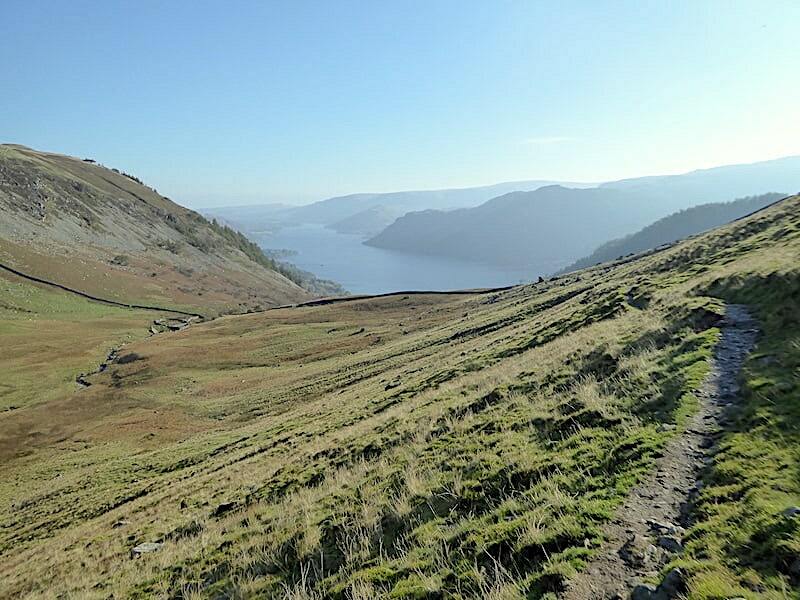 Another look over to Glencoyne Head as the path steepens slightly once again and Sheffield Pike casts its shadow over us. We’re picking up a slight breeze now although it isn’t at all cold. 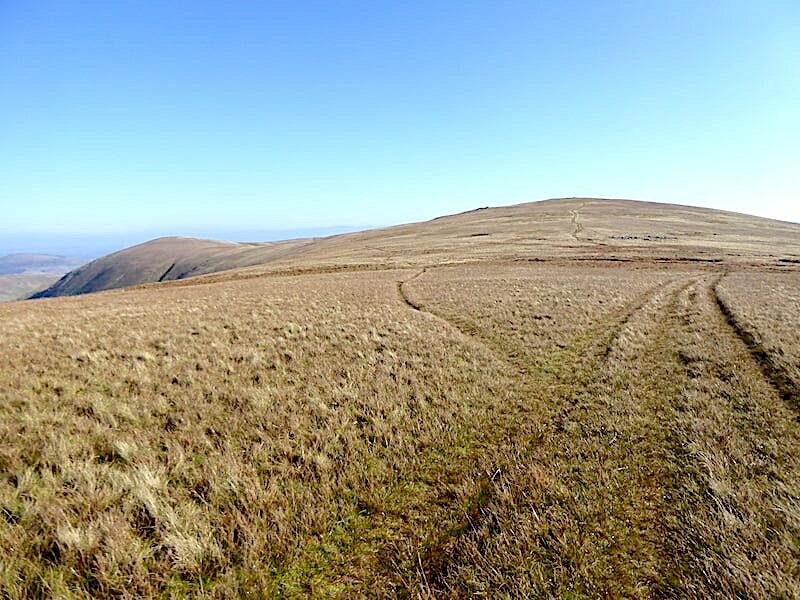 We’re almost at Nick Head at this point and as I stop to take a look back down the valley a solo walker descends towards us saying how very windy it is up on the tops and how nice it is to be out of it down here. 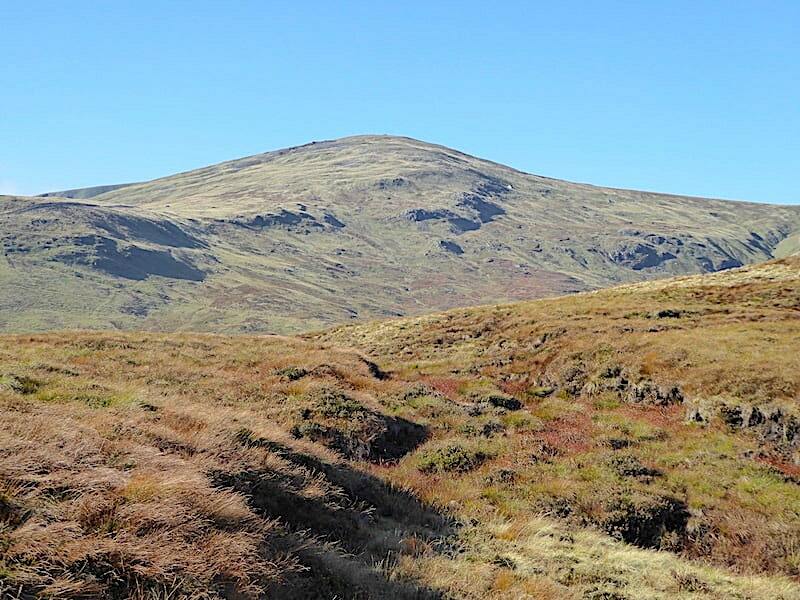 We feel the strength of it as we round the corner and emerge at Nick Head, the col between Sheffield Pike and Green Side. We down packs and put the lightweight windproofs on. As it was convenient and sheltered we decided to take a short coffee and Mars Bar stop before carrying on up Green Side. 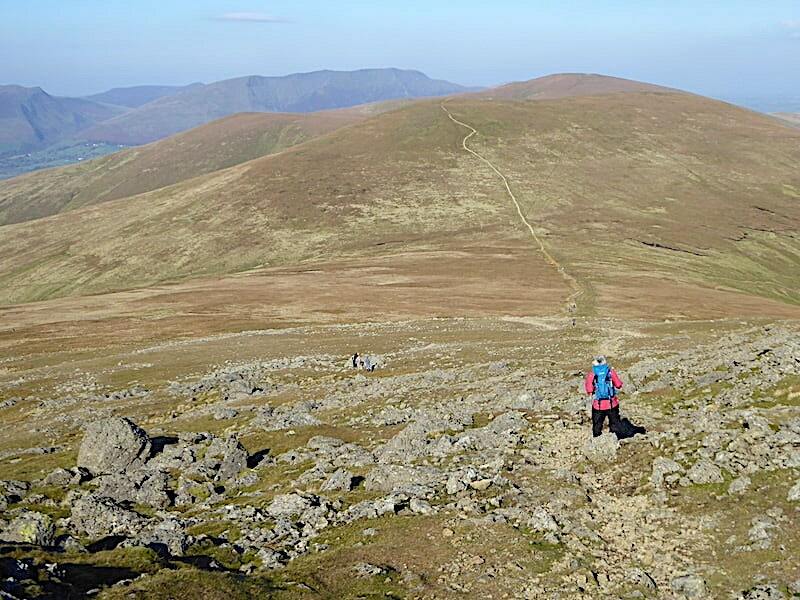 A couple of solo walkers came down from Green Side and continued on up Sheffield Pike with another solo walker taking exactly the same route but in reverse order. Other than the usual hello none of the three were inclined towards further conversation. A quick look over to Raise at the end of our break where the white shape of the ski hut is visible, to the right of the line of crags towards the centre of the shot. Up the steep slopes of Green Side to Glencoyne Head where I had intended to walk a little further round and take a shot looking directly down into Glencoyne which for some reason I managed to completely forget about. 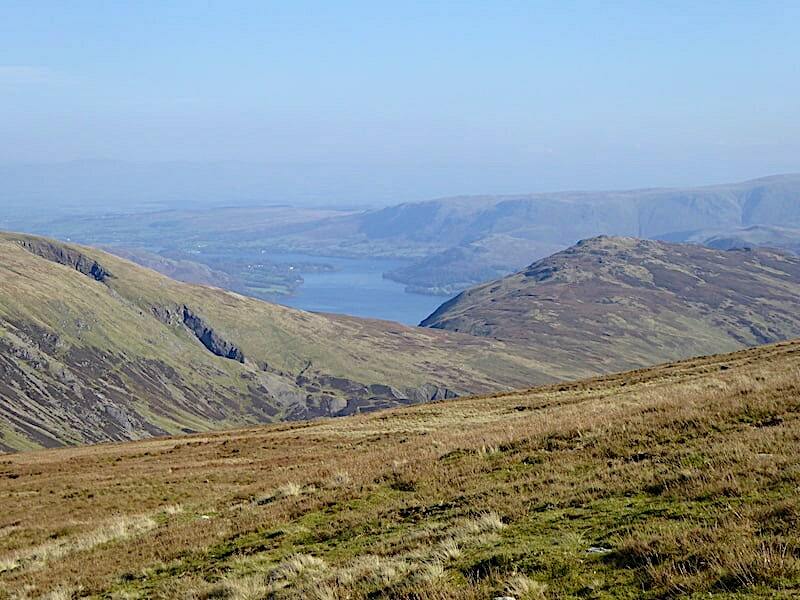 This is the closest shot I have, looking back at Sheffield Pike and Ullswater, which is nothing like the view I wanted to take but in the absence of anything else it will have to do. I’m blaming it on the strong wind which is now blowing us sideways. Continuing over Green Side with a peep down toward the palmate spoil heaps radiating out across the old mining area below us …..
….. and a little further on we peer down into one of the collapsed mines …..
….. and then a look across the huge gouge left after the collapse, or The Big Crush as it became known, in 1862. Apparently it happened on a Sunday when no-one was working so fortunately there were no fatalities. 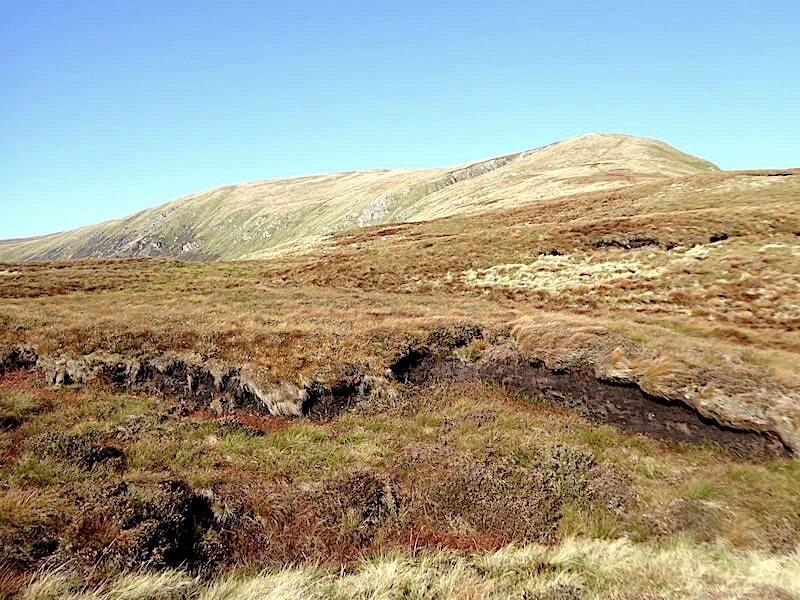 Well beyond the mine collapses now and we carry on over to the summit of Green Side. Looking back to the skyline we can just about make out the long ridge of the far eastern fells leading up to High Street. 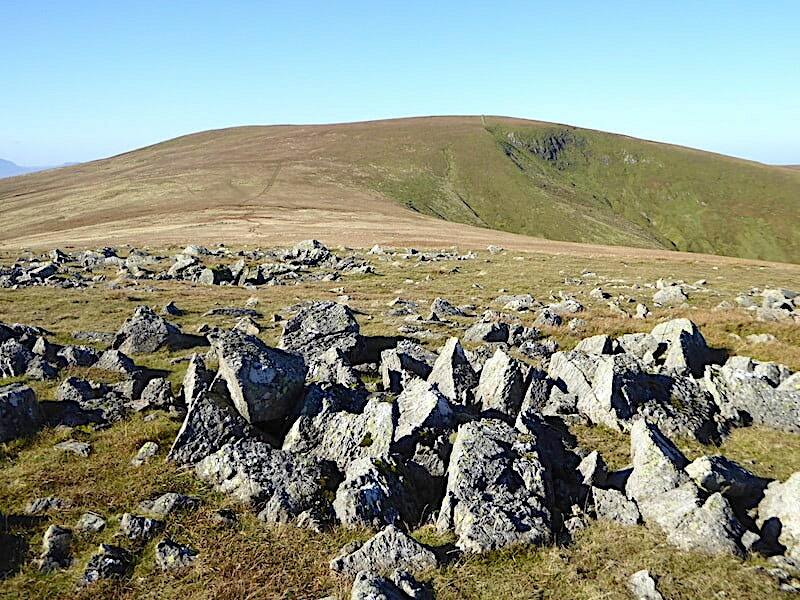 White Stones, the high point on Green Side, with Stybarrow Dodd rising behind it. Things have now become a whole lot draughtier thanks to the lack of any barriers to the strong wind. Thankfully its coming up from the south so it isn’t a cold wind but its still making our eyes water profusely. 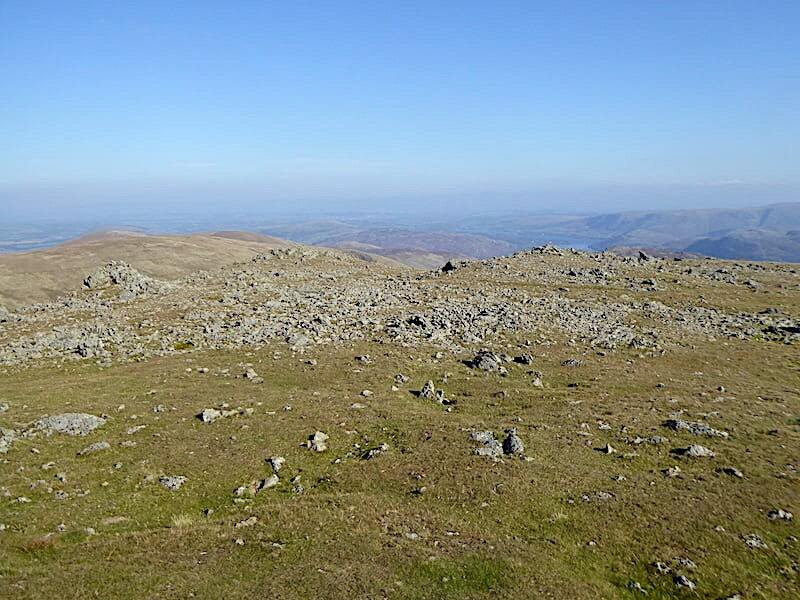 Here are a few shots taken from White Stones before we moved on …..
….. looking east over to Raise where the ski hut is clearly visible and beyond it are Catstycam and the Helvellyn range where very little is visible, clearly or otherwise …..
….. now looking west where the path up to Stybarrow Dodd is also clearly visible …..
….. looking north to Great Dodd with the tops of Skiddaw and Blencathra peeping up over either side of it. 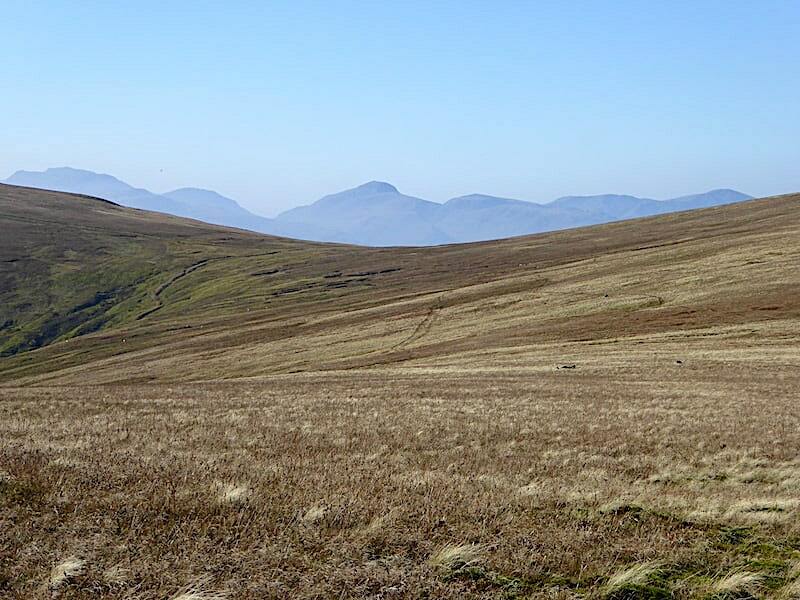 Carrying on over the path to Stybarrow Dodd where all is grass and largely featureless but this view across Sticks Pass provides an interesting if hazy skyline of Scafell Pike, Lingmell, Great Gable, Kirk Fell, Red Pike and Pillar. I did say it was rather featureless but that doesn’t prevent it from being a very enjoyable tramp and it was only slightly squelchy in a handful of places. 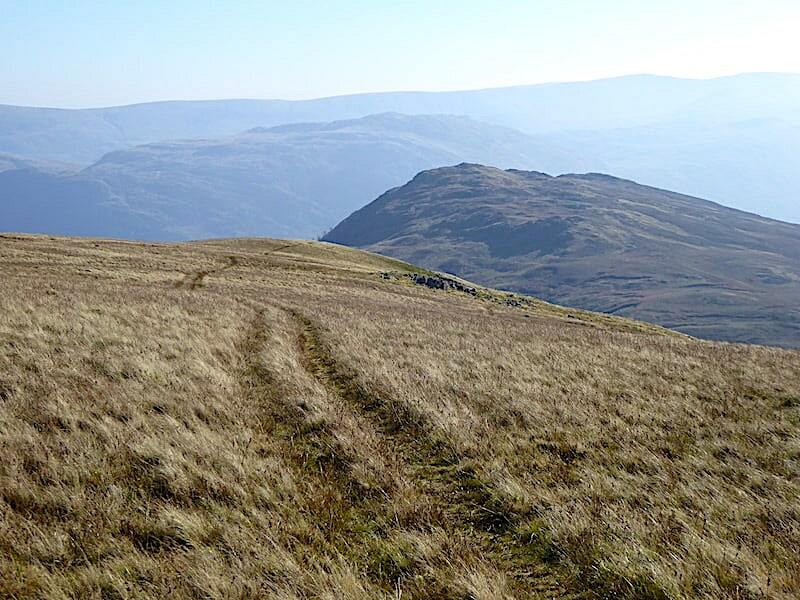 I took this look back at the point where the path over to Hart Side forks off left from the main track between White Stones and Stybarrow Dodd. 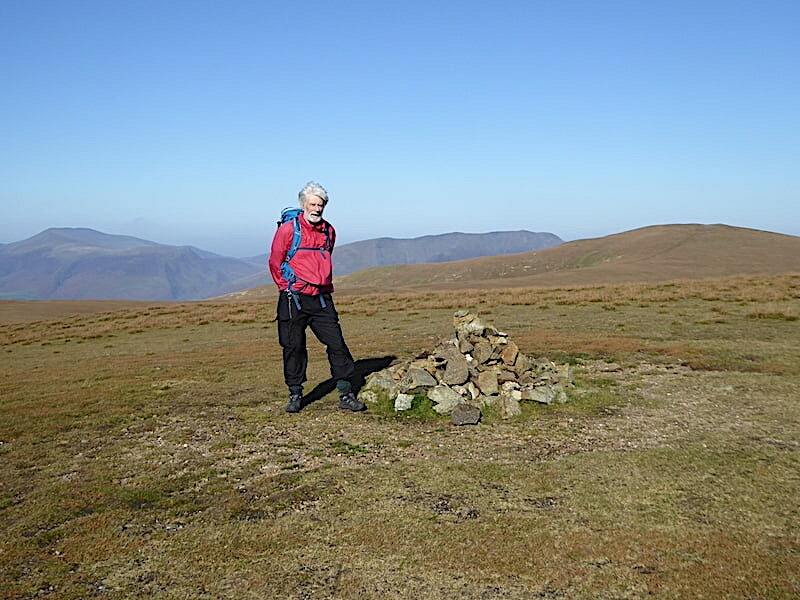 After four miles of uphill walking we reach the top of Stybarrow Dodd with just enough time for a quick shot of J at the summit cairn on Stybarrow Dodd before a large walking party, coming across from right of the shot, reached it. 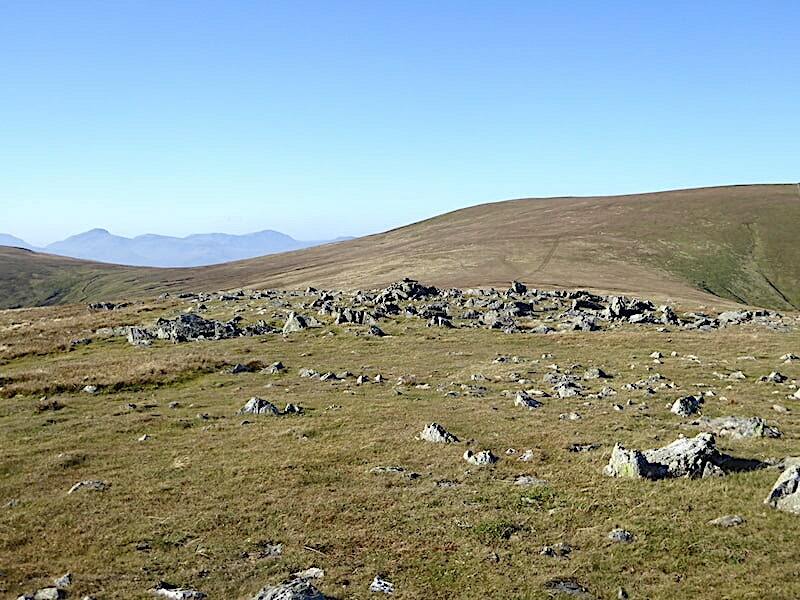 They are the first people we’ve seen since we saw the three solo walkers back at Nick Head. Its even wilder up here than it was on White Stones as evidenced by J’s hair, jacket and trousers. 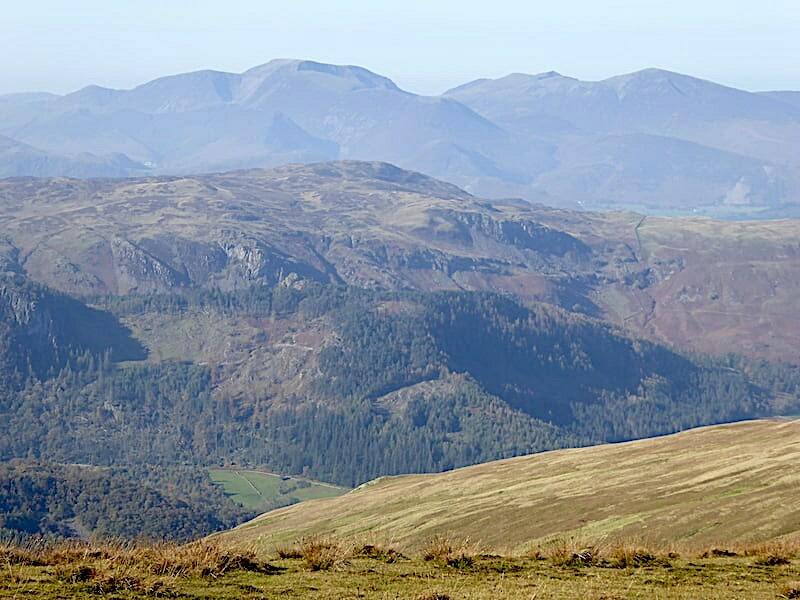 Skiddaw, Blencathra and Great Dodd on the skyline. 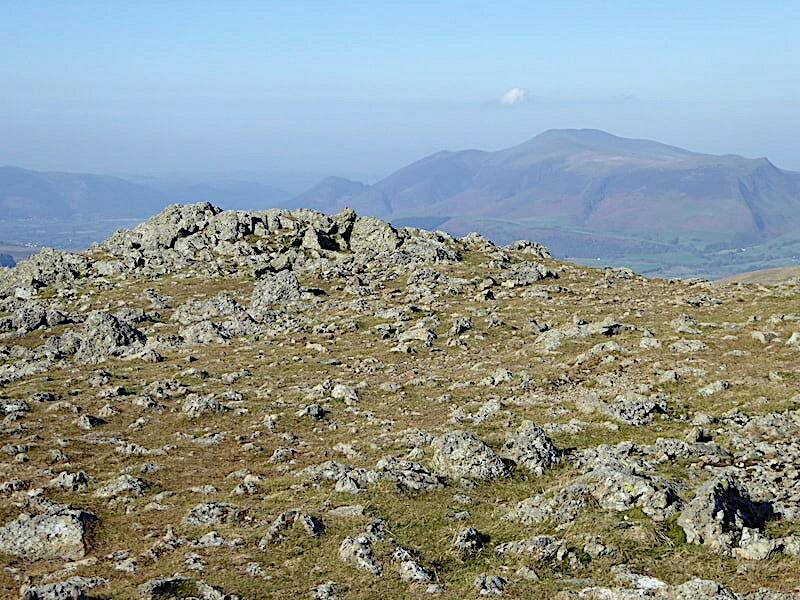 A closer look at Watson’s Dodd and the Skiddaw massif from the summit. 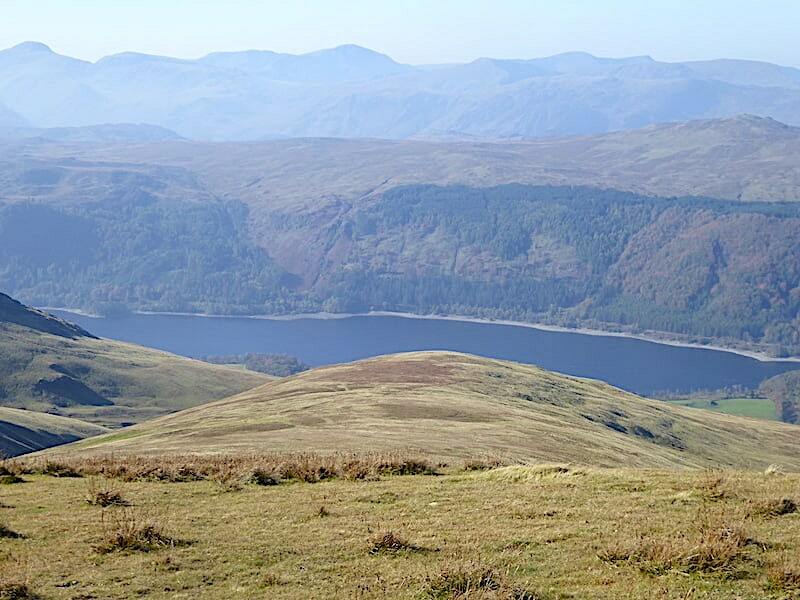 We took a short stroll down from the summit for a look across Thirlmere to Raven Crag, in the centre of the middle foreground, below it is the top of Great How while behind it is the High Seat/Bleaberry Fell ridge. 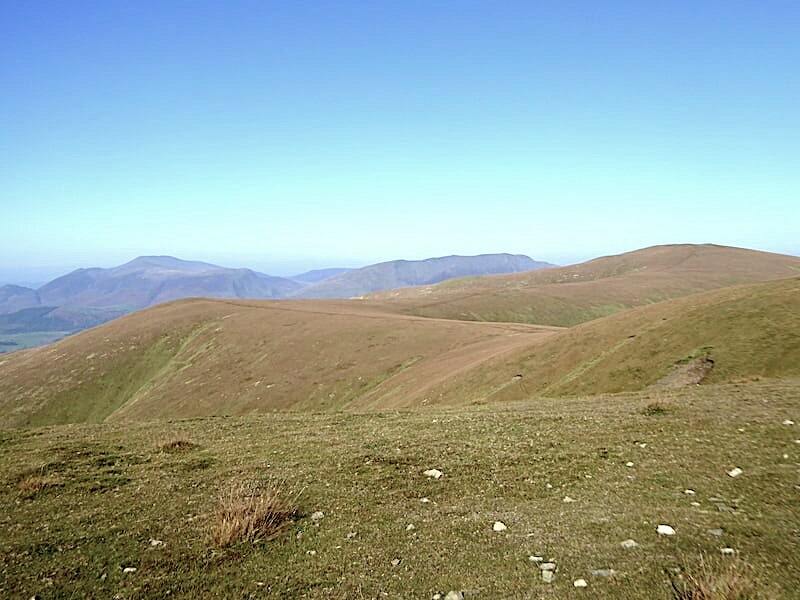 A view of the whole of the Coledale Horseshoe, more or less, beyond the top of Bleaberry Fell. 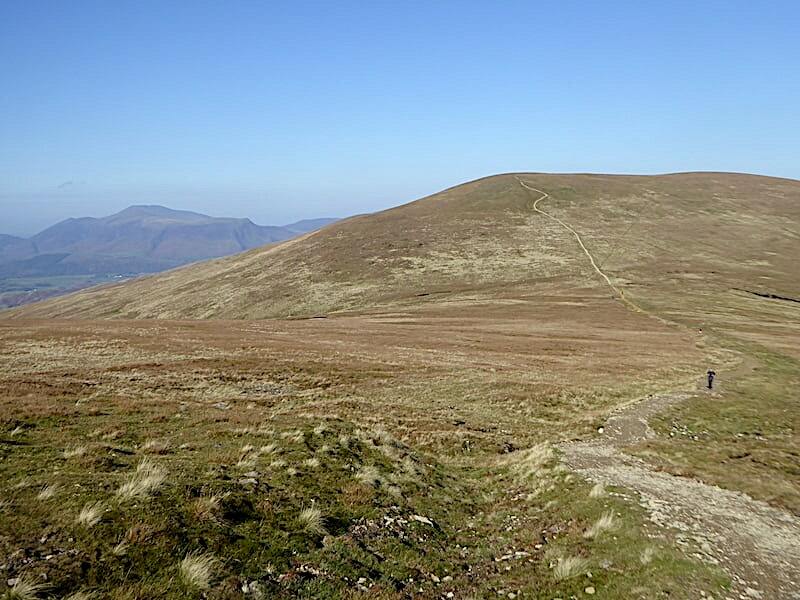 Watson’s Dodd rising over to Great Dodd with the Skiddaw range and Blencathra behind them. 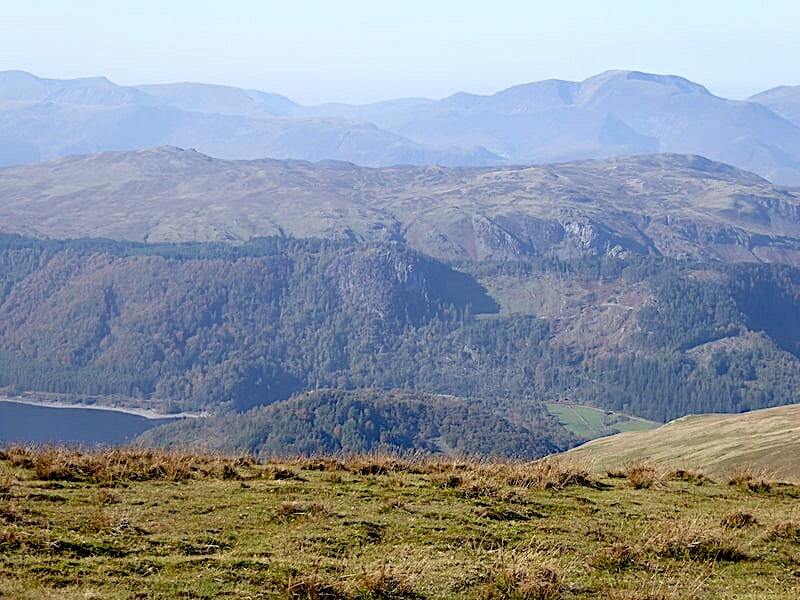 Looking over to the Wythburn fells on the other side of Thirlmere and making a mental note to check whether the clearing of storm damaged trees has finished yet and if the road and the various paths over there are fully open again. If not I hope it won’t be too long before they are because there are some grand little walks across there, and they come in very handy when rough weather puts a damper on walking the high fells. 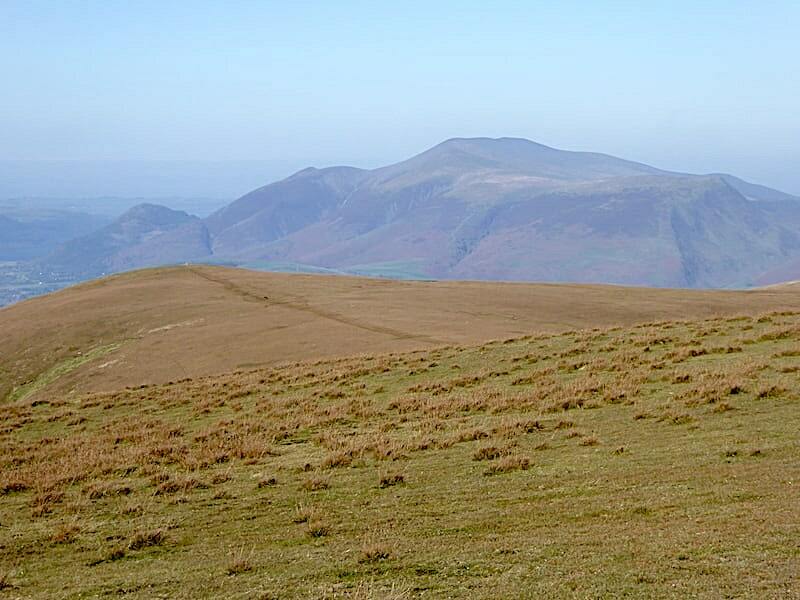 A closer look at the Coledale Horseshoe starting with Grisedale Pike on the right skyline and ending on Barrow, in the murk immediately below it. I’m sure you can identify all the ones in between the two. 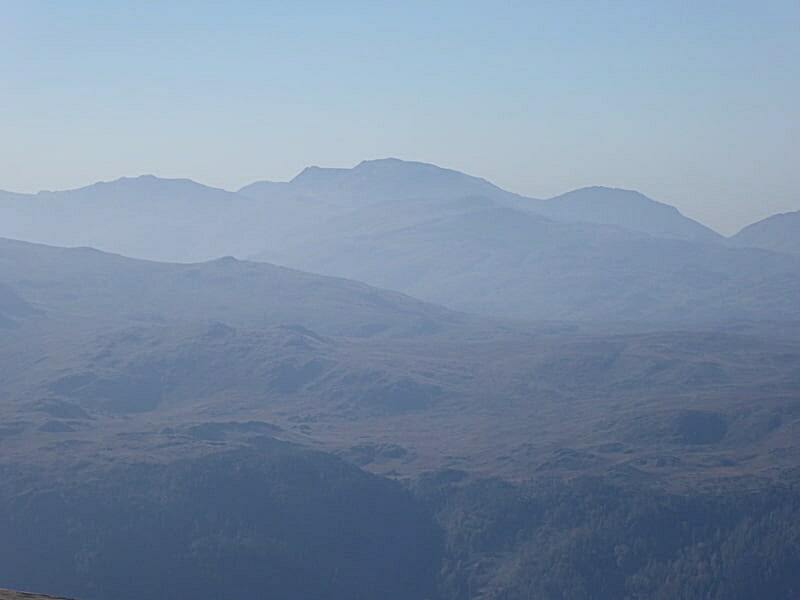 Here are a few skyline close-ups with apologies for the very hazy but unavoidable shots …..
….. Great Gable, Kirk Fell, Red Pike and Pillar …..
….. Esk Pike, Scafell Pike and Lingmell …..
….. Crinkle Crags (just), Bowfell and Esk Pike. We make our way off Stybarrow and head down to Sticks Pass, we were still being blown about but things improved the further down we went. It looks as if there is no-one around and, although it couldn’t be called busy, there was a steady stream of walkers heading in a variety of directions. Everybody we met was cheerful and returned our greetings, most were down to t-shirt level and one chap had even gone so far as to get his shorts back out of winter storage. I did briefly consider that myself but ended up being glad that I’d decided against. 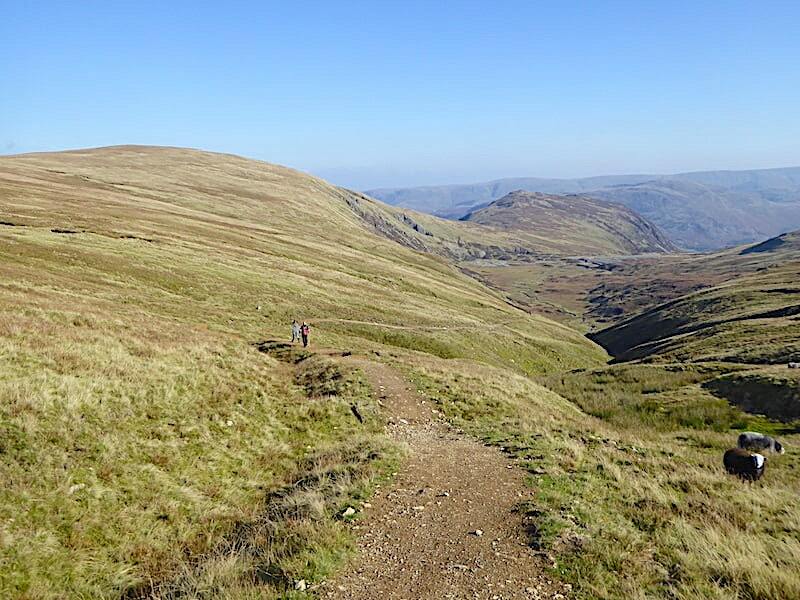 A look along Sticks Pass towards Sheffield Pike with a little smidge of Ullswater just below it. A look back at the path we followed off Stybarrow as we follow this one up to the summit of Raise. We’ve just emerged from a comfy little hollow over to the left of the shot where we took a short food break before carrying on to the summit. 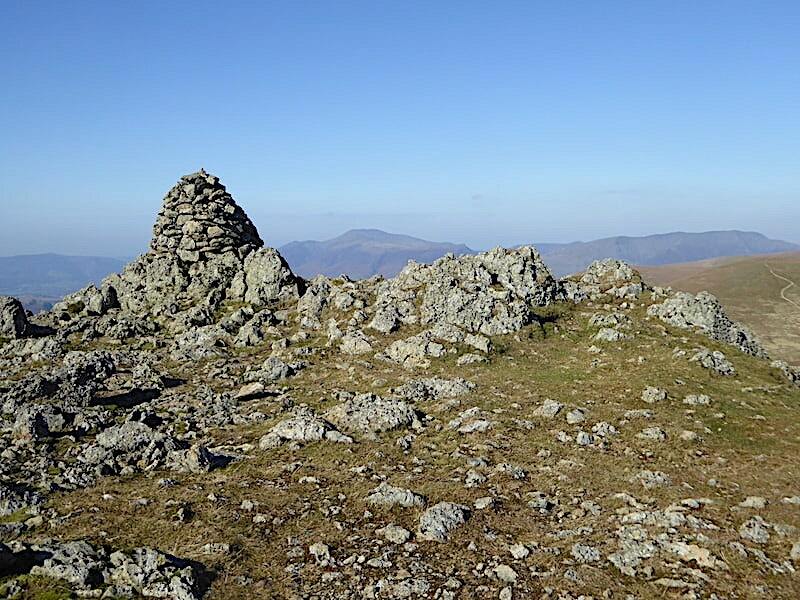 The summit doesn’t offer much by way of comfort or shelter so the thought of stopping for a food break in the teeth of the wind held no appeal whatsoever. Based on previous experience I wasn’t looking forward to walking up this path. Four years ago was the last time we walked on it and I remembered it being very loose, deeply rutted and an absolute pain in the you know what. It looks as though improvements have taken place in the intervening four years, the path seems to have been lifted, banked and well compacted with raised run offs angled across it at regular intervals, all of which should prevent the whole thing disintegrating back into the rutted mess it was before. I hope so anyway because it was so much better to walk on, it didn’t make it any less steep of course but at least you didn’t have to be too concerned with where you were putting your feet. 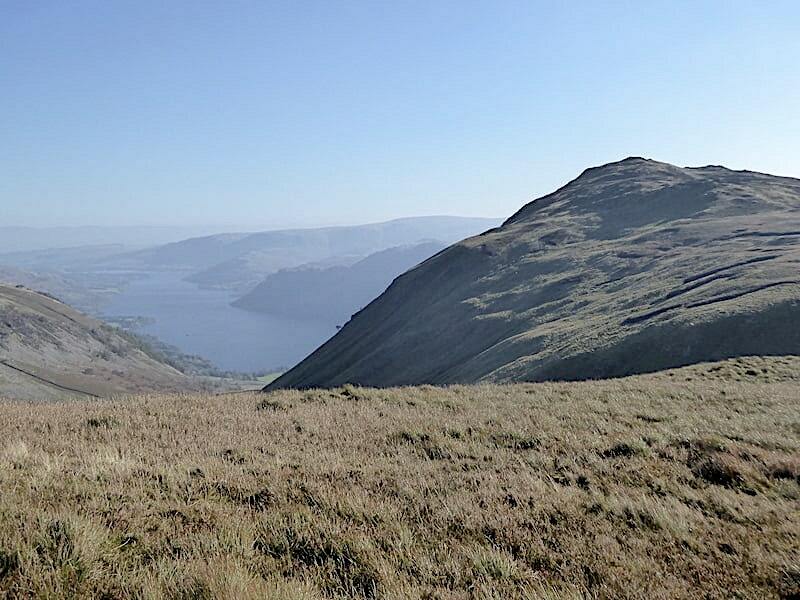 Ullswater appears between Green Side and Sheffield Pike as we continue up the path. The young man in the previous shot caught up with us as J was giving me, and my little legs, a haul up over one of the more elevated and rock buttressed run offs a little way below the summit. The pair of them then strode on ahead having a good old natter while I dusted myself off and got under way again. No idea what they were talking about but the conversation carried on almost to the top where they parted company, the young man over to the cairn and J waiting for me to catch up. The wind was very strong indeed up here and my windproof was rattling and slapping against me like a thing possessed. 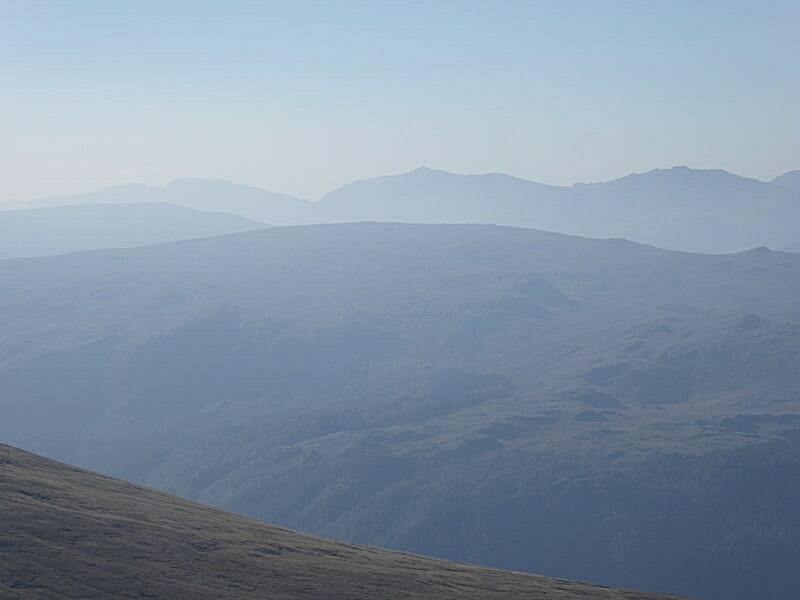 As usual J acted as a backstop while I took a few shots, this one looking over towards White Side on the right with Catstycam and the Helvellyn range to its left. 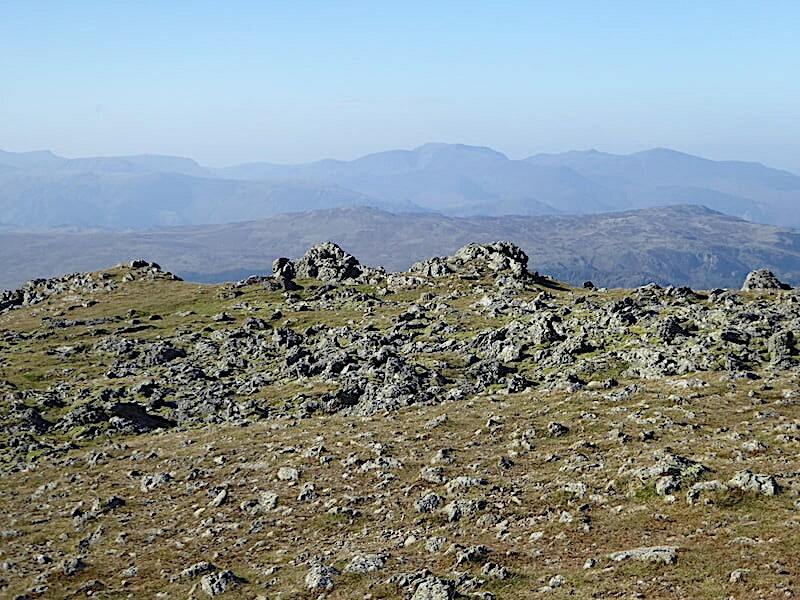 The exposed and rugged nature of the summit shows why we had the food break just a little lower down from here. 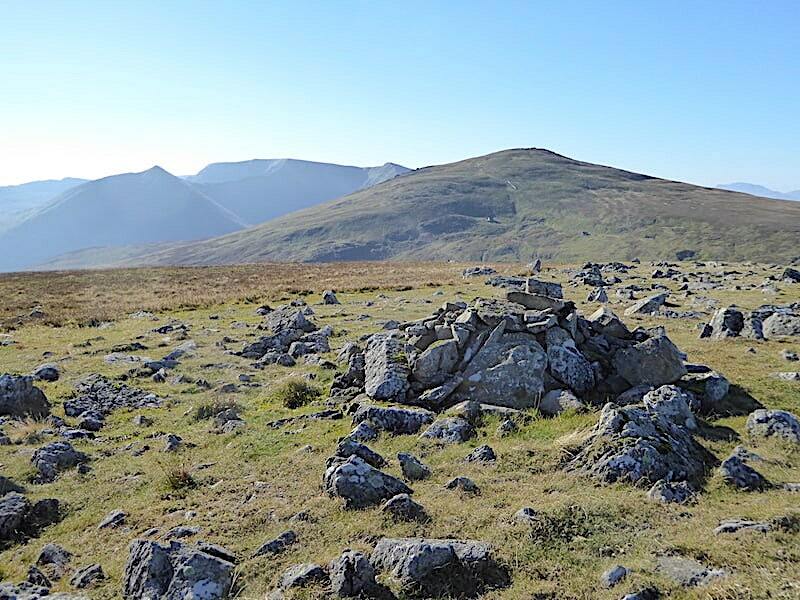 More of the stony summit terrain as I look across to the Skiddaw group …..
….. and then over to the north western fells …..
….. followed by a view of not very much at all looking to the east and then …..
….. the summit cairn with Skiddaw and Blencathra beyond it. 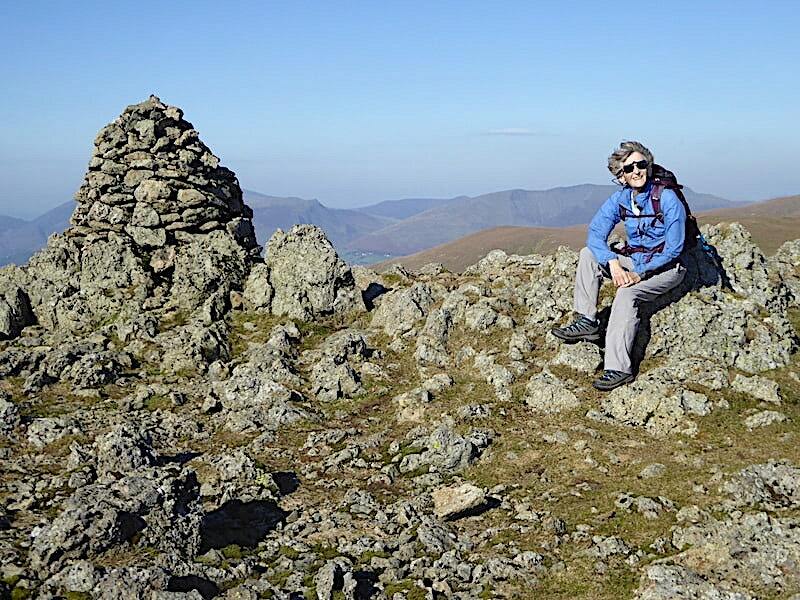 With clothing flapping wildly and hair whooshing sharply backwards I plonk myself on a very uncomfortable rock for a summit photo asking J what he had just said. His words had blown away on the wind and so did mine so neither of us had any idea what the other had said. Not that it mattered much because we often blether on about trivia and inconsequentialities when we’re out walking. J’s had enough of being battered so he heads back down again. The couple just below him on the left are gathering their things together and eventually hit the path just in front of us. 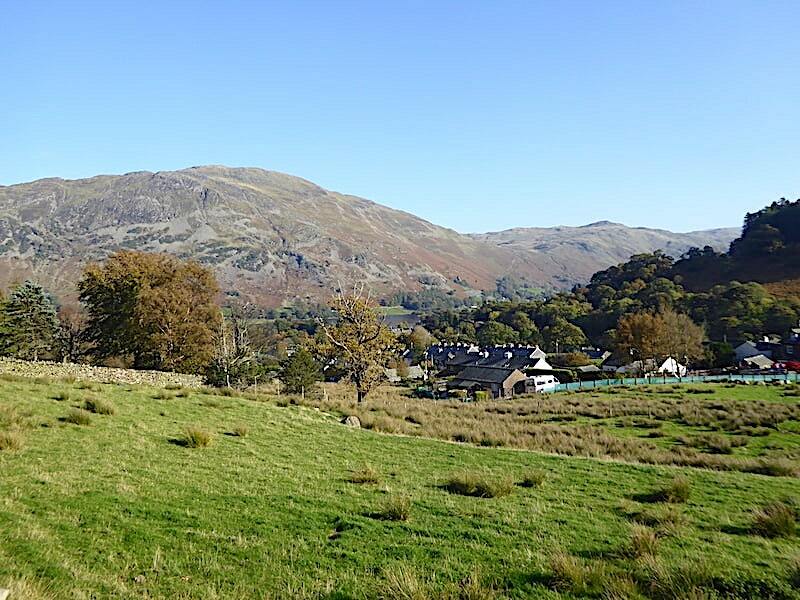 They also turn off down Sticks Pass towards Glenridding …..
….. so there they are again, the lady was quite agile and got along quite quickly but her companion was less so and was using walking poles to help with his balance it seemed. We kept stopping to put a bit more distance between us and them, we never want people to feel harassed by us snapping hard on their heels, but despite that we couldn’t help but get closer and closer. Fortunately further down, as the path becomes looser and rockier, he stopped to re-tie his boots so we were able to pass by them and they could continue happily at their own pace. 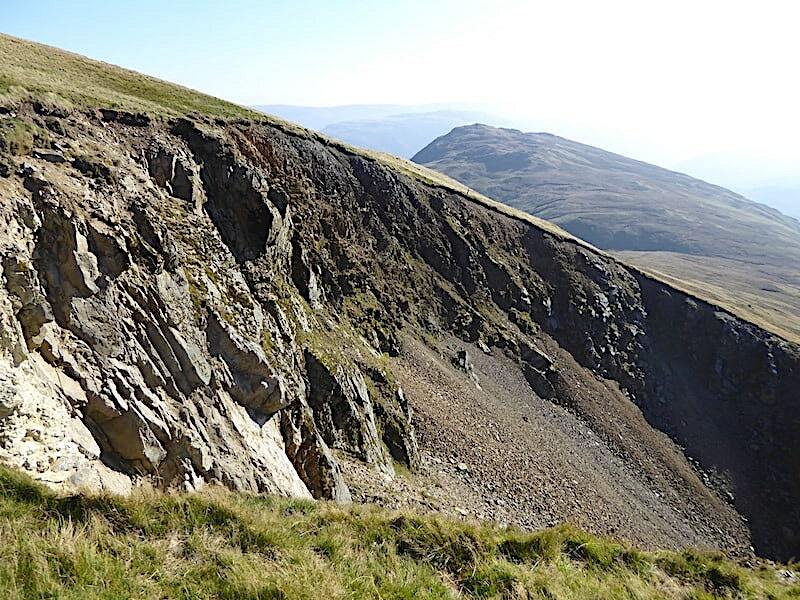 Almost at the bottom of the pass now so its an easy stroll down to the spoil heaps …..
….. where we pass below the holes left by The Big Crush and find a couple of flat stones to perch on while we take a much needed drinks break. We’d lost the windy conditions as we dropped down the pass and of course the lower we got the warmer it became so by the time we got to this point both of us were desperate for a long glug of whatever was in the first bottle which came to hand. 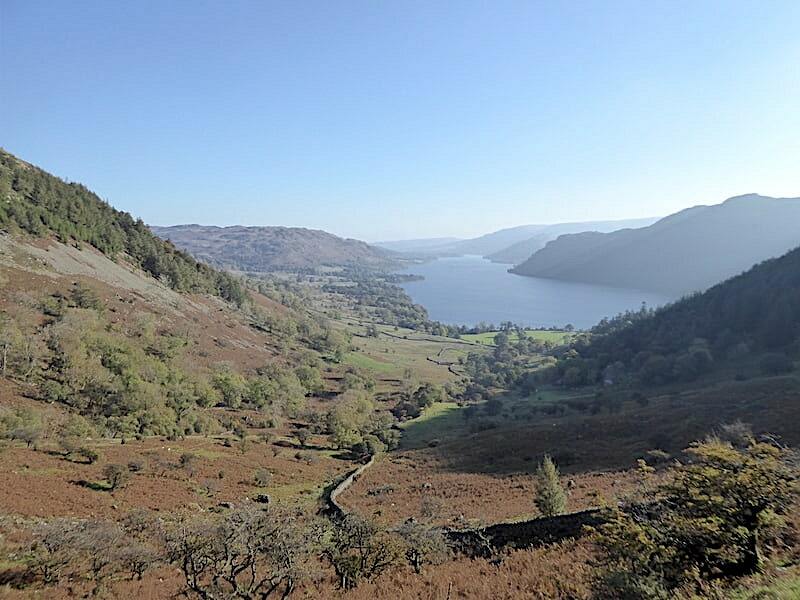 We had a quick chat about what route back we should take, up to Nick Head and then back down the Glencoyne path, over Sheffield Pike and then the Glencoyne path from the depression below it, or back down the Greenside Road and pick up the Ullswater Way path back to the car park. We opted for the latter. 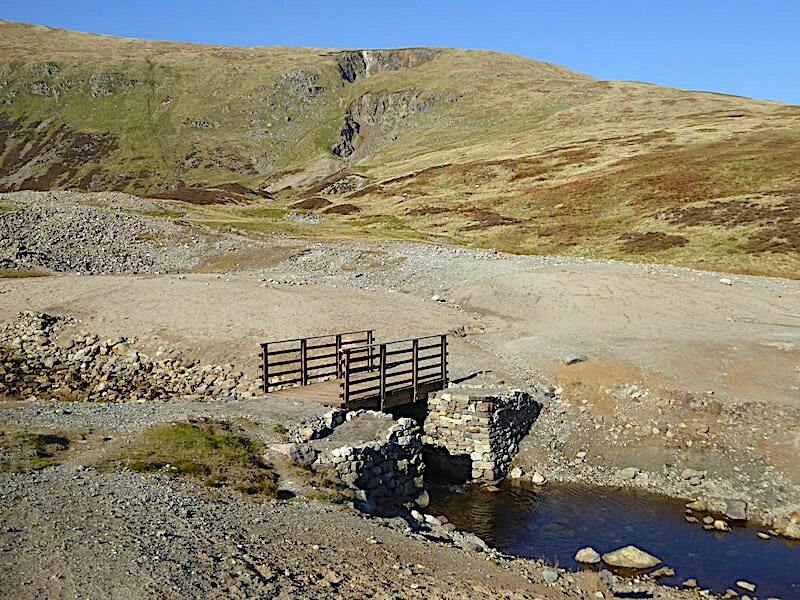 We carry on through the lunar landscape of the spoil heaps and head for the bridge across Glenridding Beck …..
….. with a glance over at Sheffield Pike looking nicely autumnal in the afternoon sun. Looks like a new bridge has been installed since we were last up here one week shy of a year ago, that was a similarly sunny day but with a bitingly cold northeasterly wind. 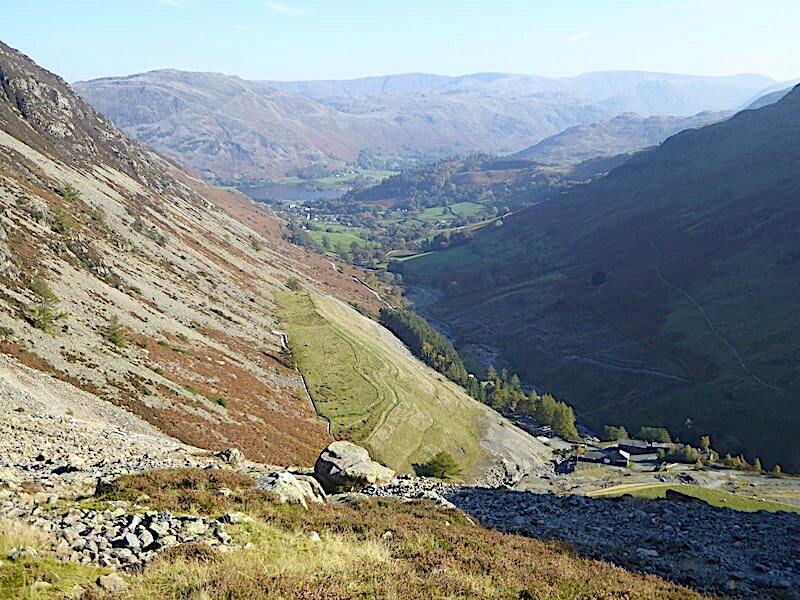 Glenridding comes into view far below us as we make our way down to Stang End …..
….. and then make our way down the zig-zag path below it. 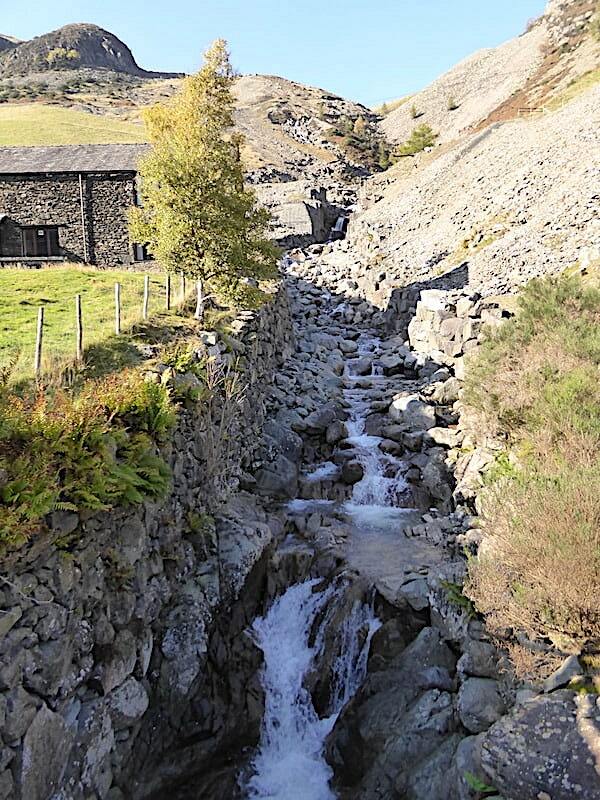 Glenridding Beck sparkles like a ribbon of silver tinsel as it splashes its way down to Ullswater. 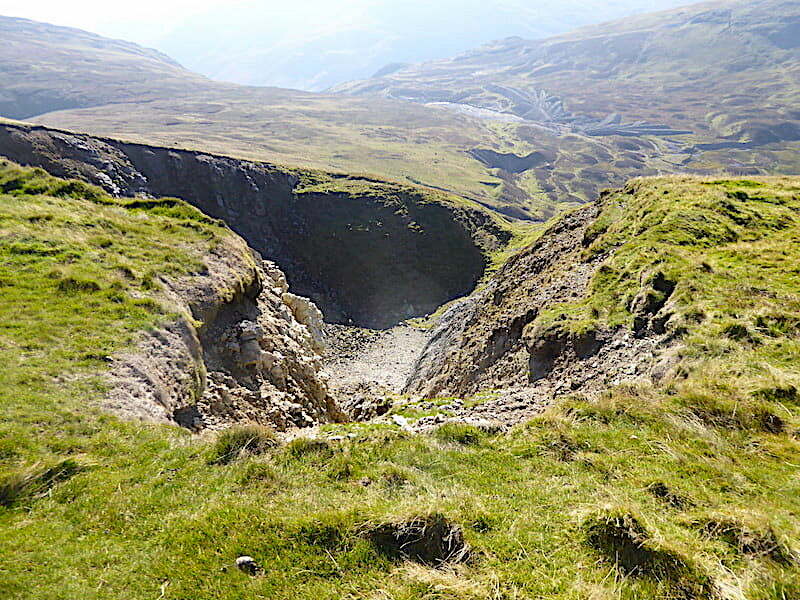 Just a couple more zig-zags to go before we reach what remains of the old Greenside Mine …..
….. with a quick look along the old water leats below Sheffield Pike as we descend. The sunlight bounced so strongly off the light coloured scree and boulders alongside Swart Beck that it almost hurt the eyes to look at it. From here we began walking down the Greenside Road and just before we reached the row of cottages alongside it we met a group of three, one man and two women, who stopped and asked if this was the way to Striding Edge. We gave them directions and asked if they were intending to cross it or were simply going to have a look at it. 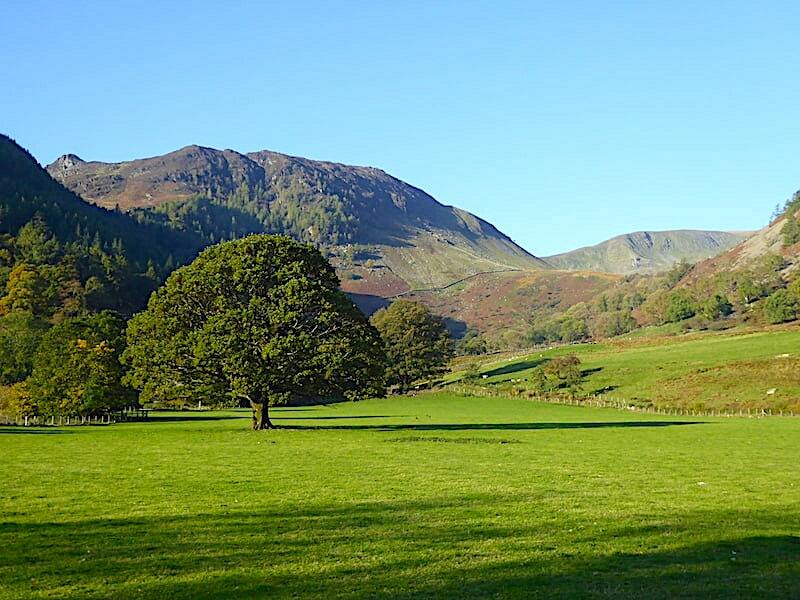 Seemed as though the intention was to go across, adding that they had thought about going up Mount Snowdon today but had decided against owing to the forecast for very strong winds. 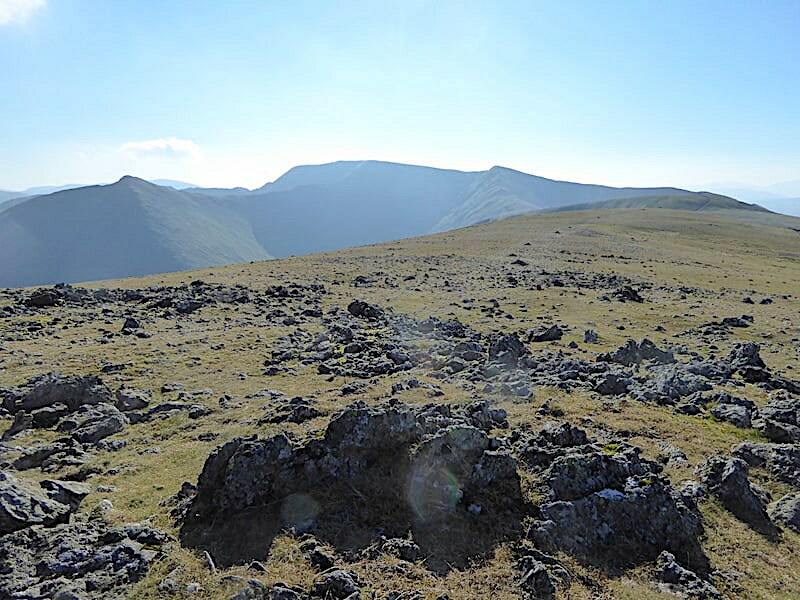 Leaving aside the somewhat puzzling reference to Snowdon, I pointed to my very wind blown and tangled hair, which by now was protruding every which way from my head, and mentioned that it was very strong up on the Helvellyn ridge too so they would need to bear that in mind. 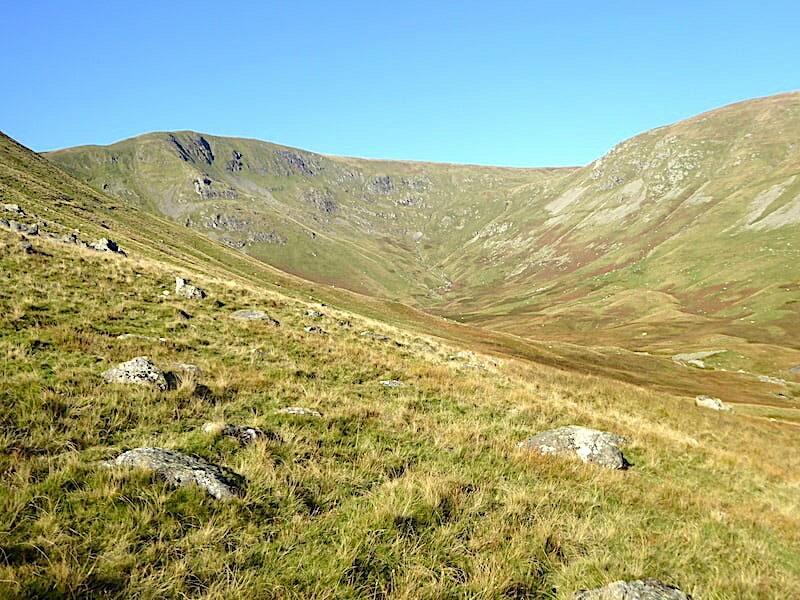 By now it had turned three o’clock and they still had a longish walk up to The Hole in the Wall before they could set foot on Striding Edge. With sunset only three and a bit hours away we wondered if they might be pushing it a bit to walk up there, walk across the Edge, get up onto Helvellyn and then get back down again in what daylight remained, especially as by their own admission they weren’t very experienced or well equipped. Nevertheless, they thanked us for the directions and off they went. I hoped things would turn out well for them whatever they decided to do when they got up there. We carried on down the road still trying to get to grips with the Mount Snowdon remark. 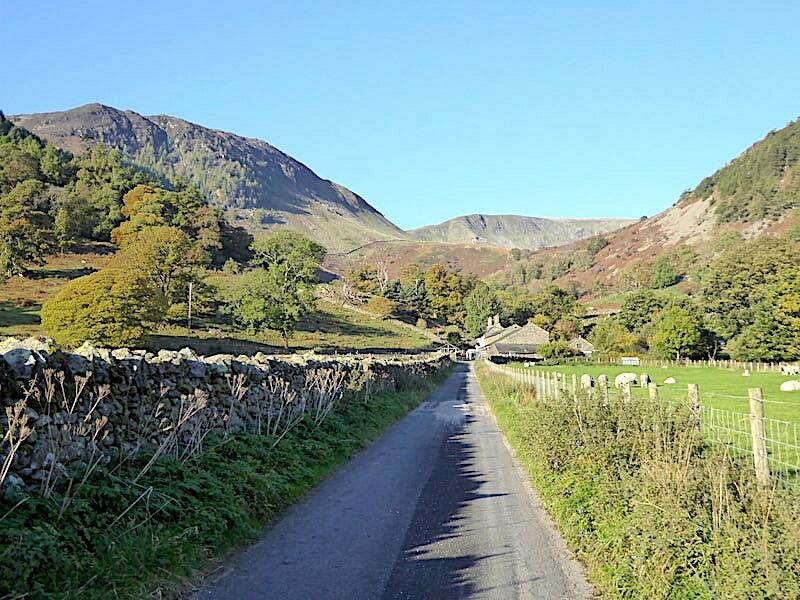 We bypass Glenridding village and, just before the turn off down to Rattlebeck Bridge, we take a left turn along the private road, although it is also a public footpath, and make our way towards the A592 coming out of Glenridding. 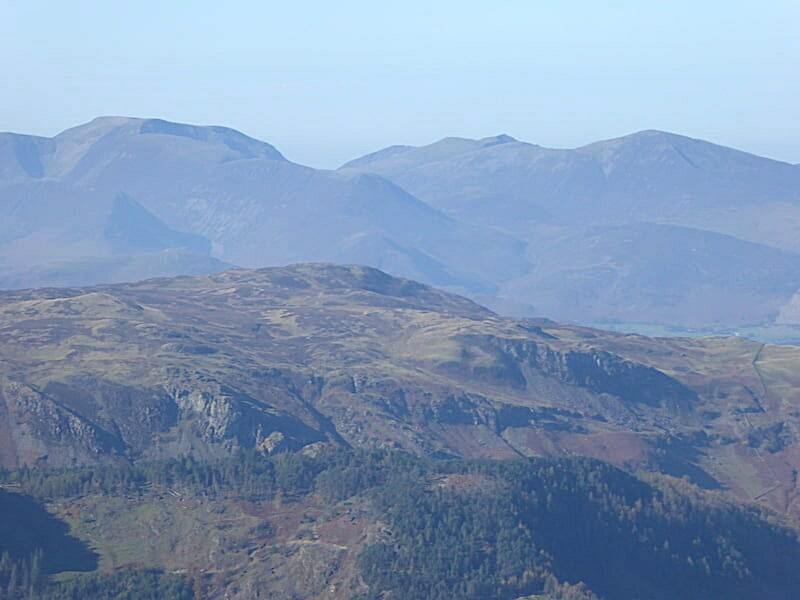 Across the village there’s a decent view of Place Fell and Angletarn Pikes. 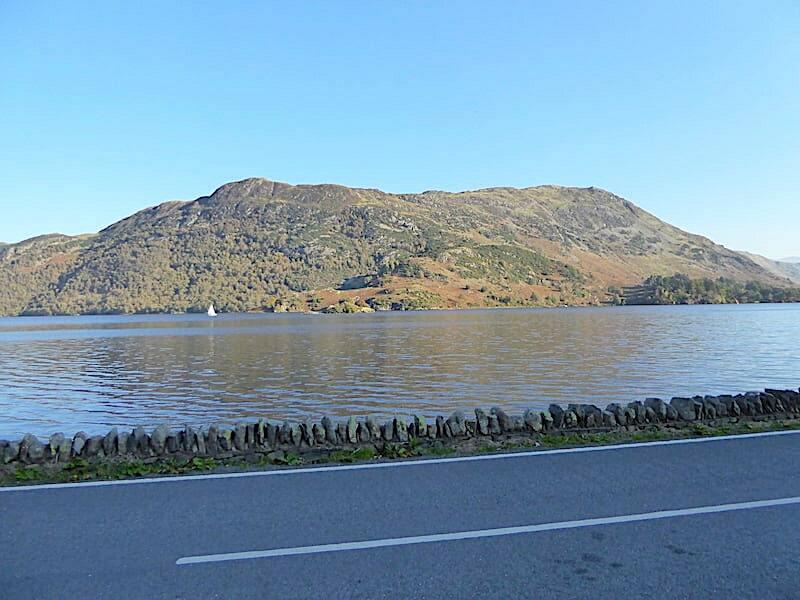 The Ullswater Way path on the lakeshore takes you more or less parallel with the road although very slightly below it. 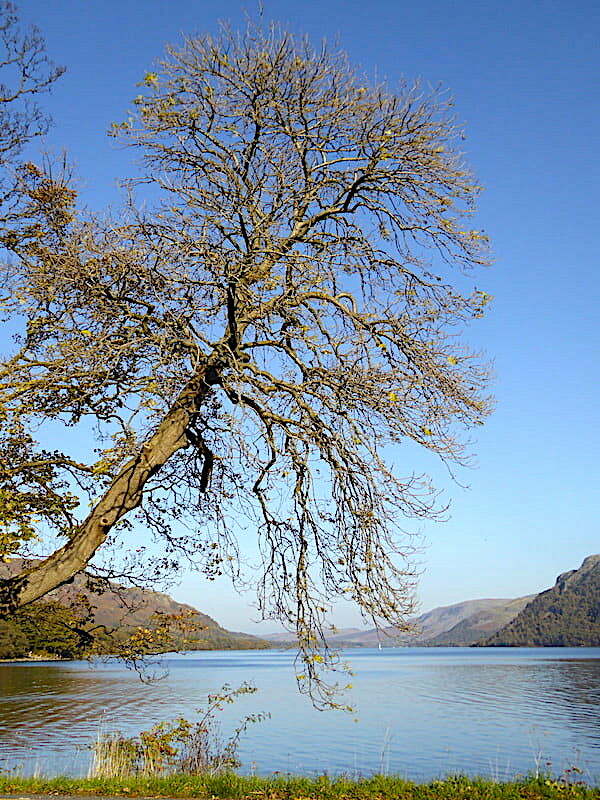 It also threads its way through the woods above the shoreline so the views of Ullswater are somewhat limited. Eventually that path comes to an end at the road and walkers have to cross the road (carefully because its generally busy) to pick up the path again. The path drops some way below the road on this side and consequently there are no views of the lake along this flatter section. 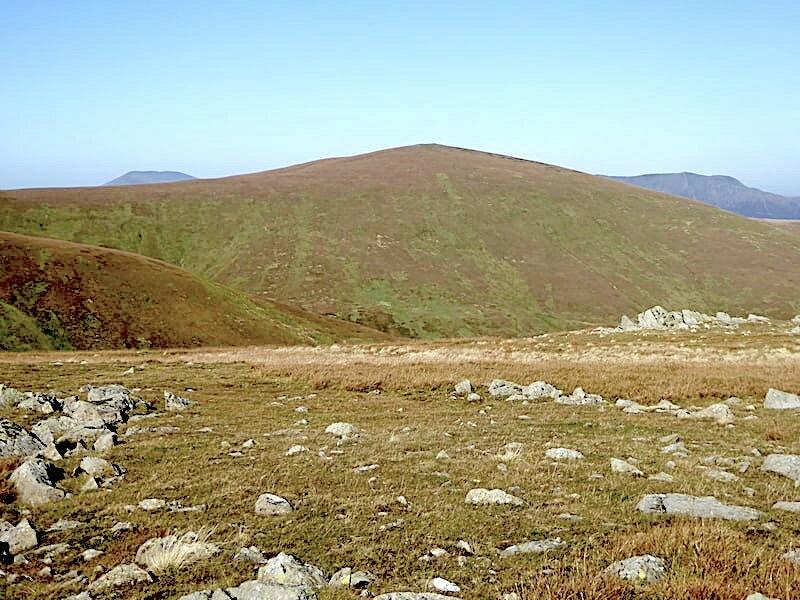 However, the sunny views of Brown Hills and Watermillock Common in their autumn colours are very pleasing to the eye. 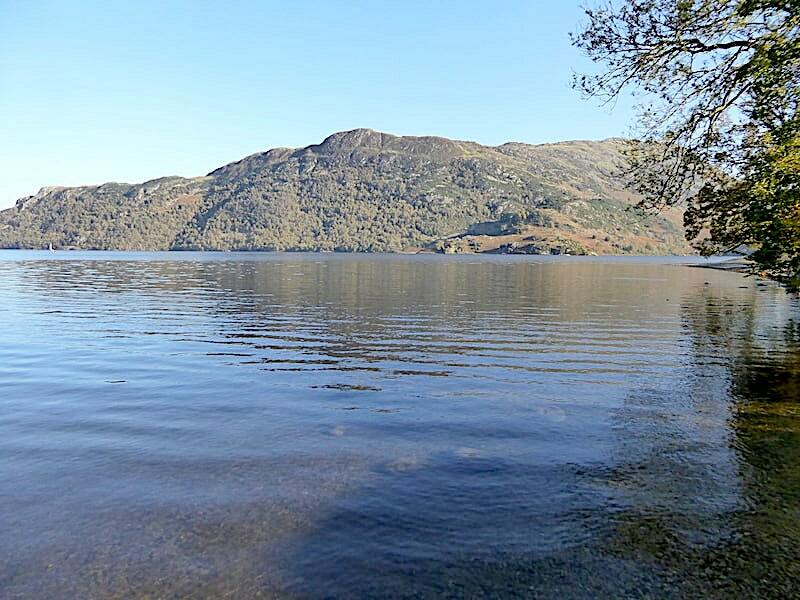 I spotted a stone conveniently jutting out of the wall so with J’s assistance up I went for this view, across the road and the water, of Place Fell, looking very nice in the afternoon sun. We are soon back at Glencoyne Bay car park so I nipped across the road and took a few shots before we headed off home …..
Another look over to Place Fell …..
….. and on the opposite shore looking towards Gowbarrow …..
….. looking along the water towards Pooley Bridge …..
….. and a full length view of one of the tree’s branches which despite having lost most of its leaves still managed to look very spectacular as it soared elegantly over the water. The car park is busy, vehicles entering and leaving constantly but most only stay long enough for their occupants to leap out and take a few quick snaps before leaping back in again and driving off to the next view point. And why not, because its a lovely scene just begging to be photographed. 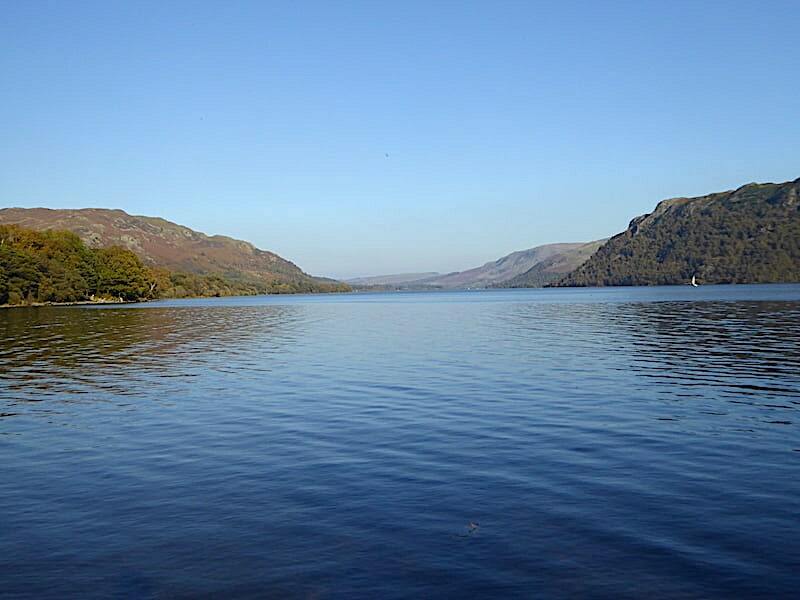 It’ll look a whole lot less serene over the next two or three days when Storm Callum gives us a pounding so we’d better get off home and batten down the hatches.